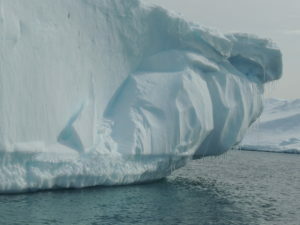 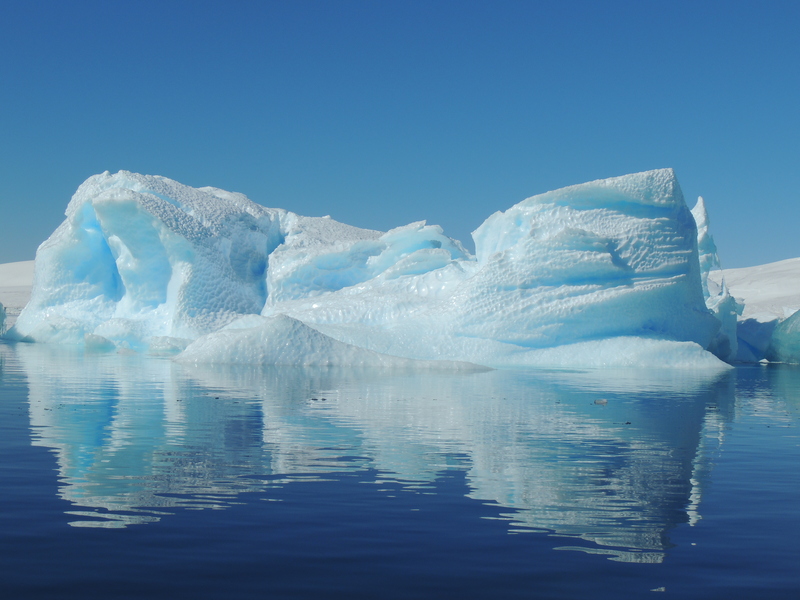 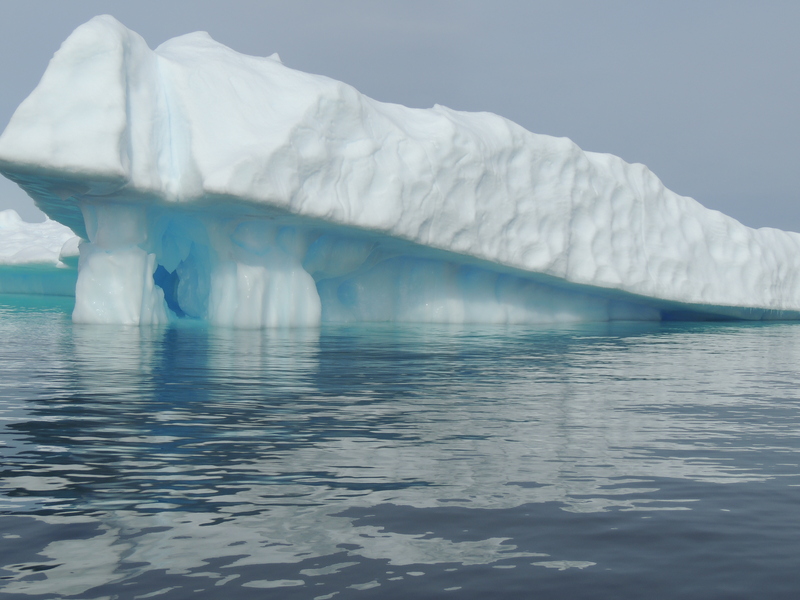 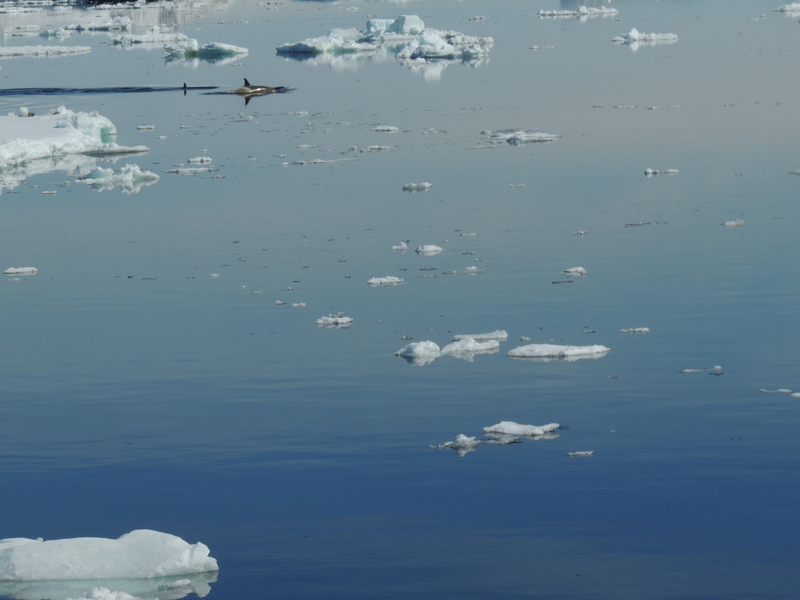 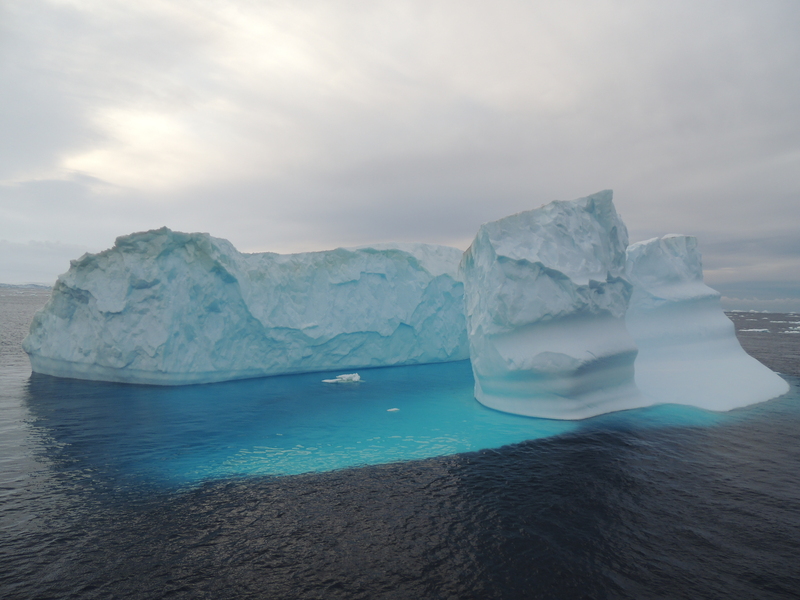 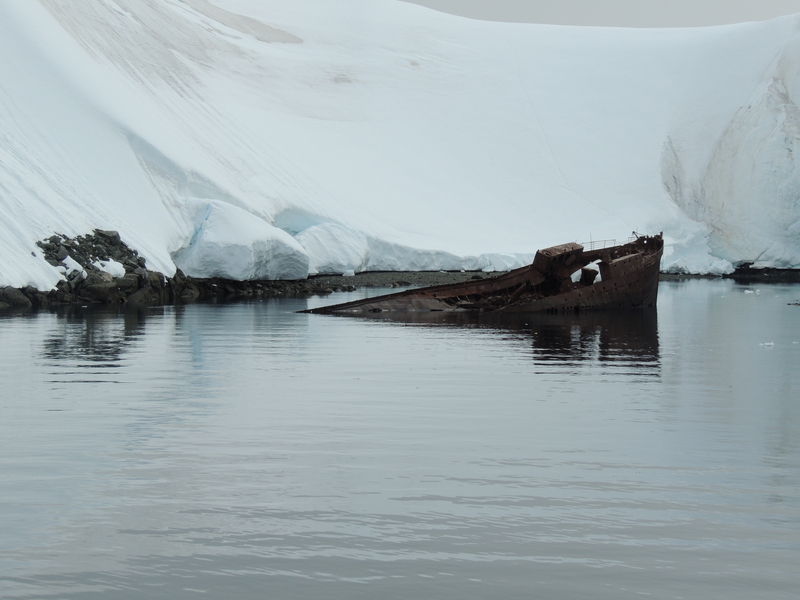 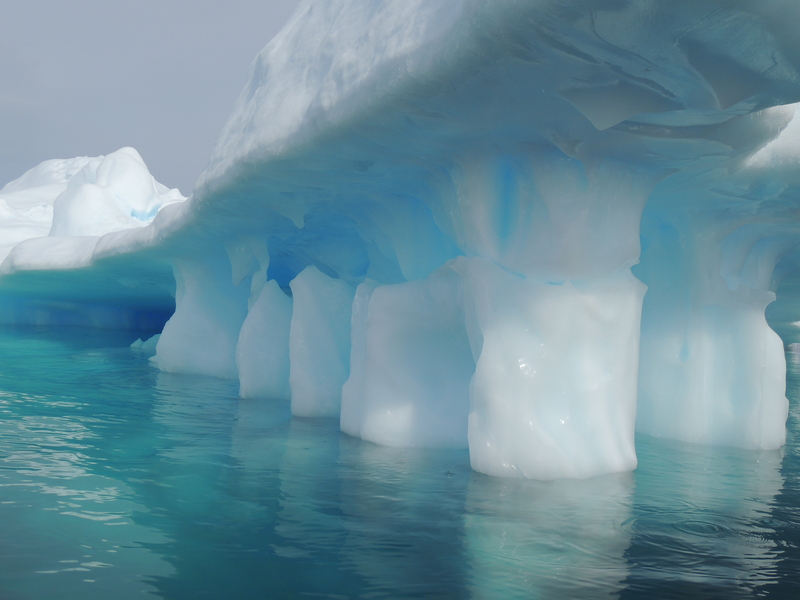 Today I woke up to the sound of ice crunching and slushing against the hull of the ship. 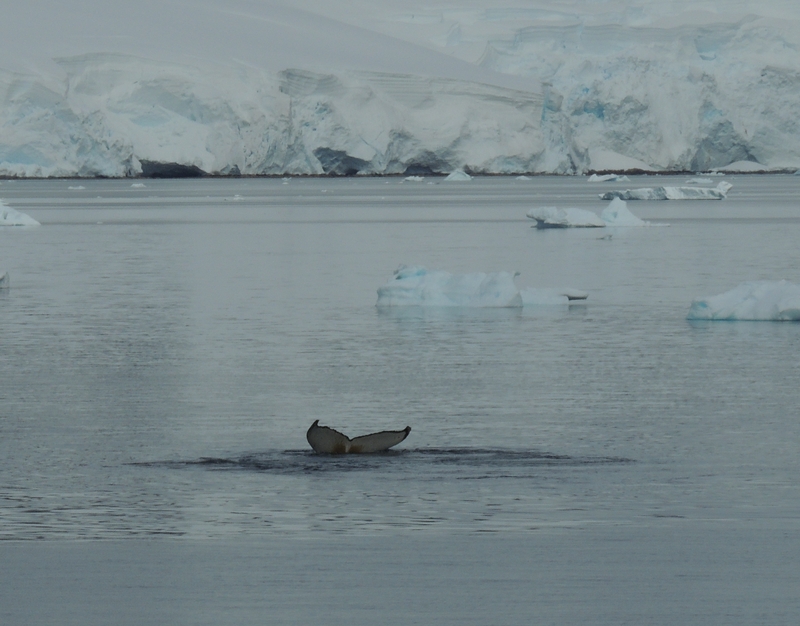 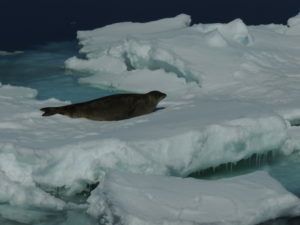 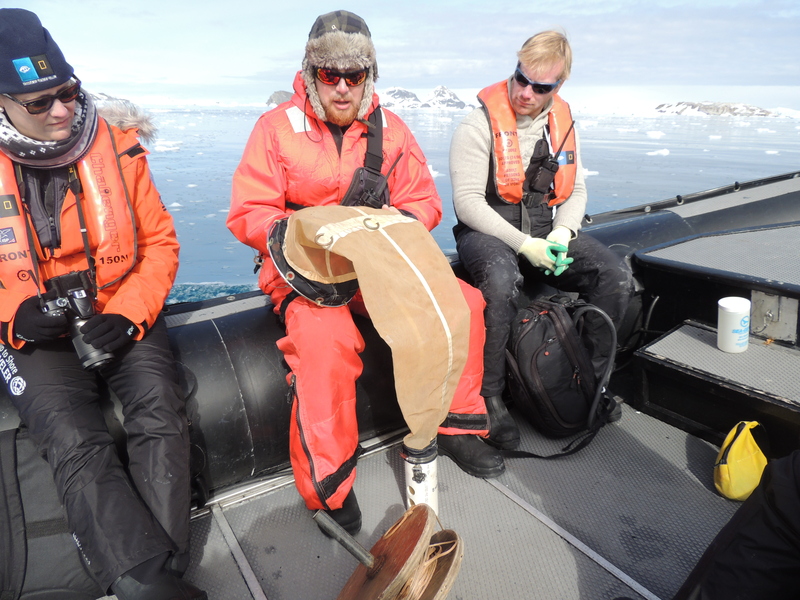 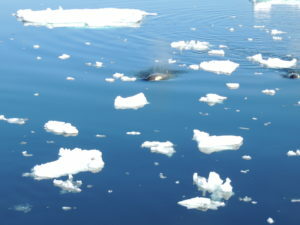 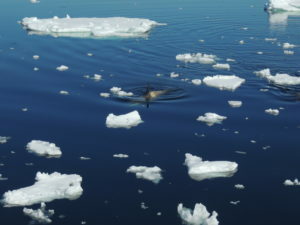 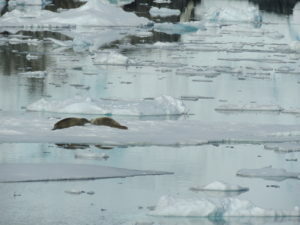 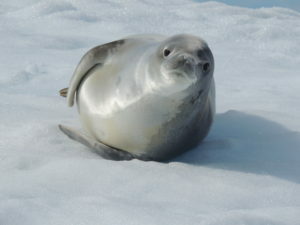 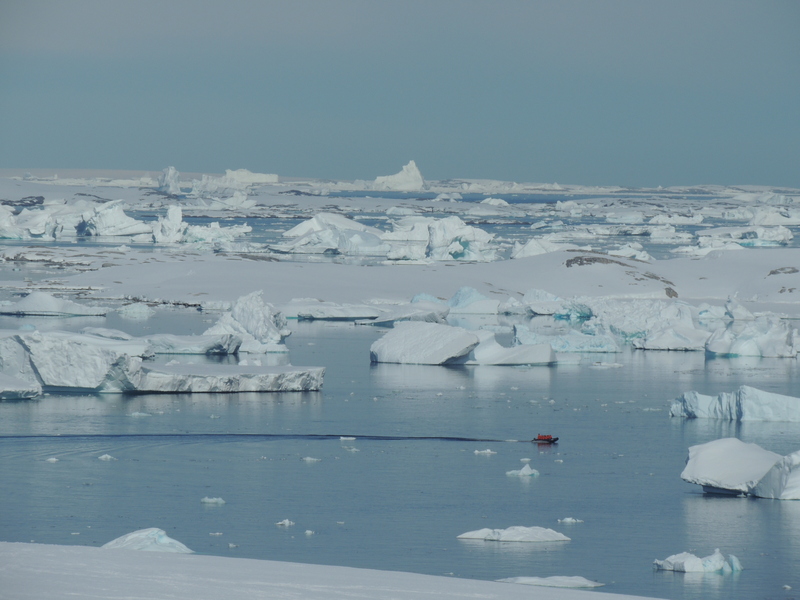 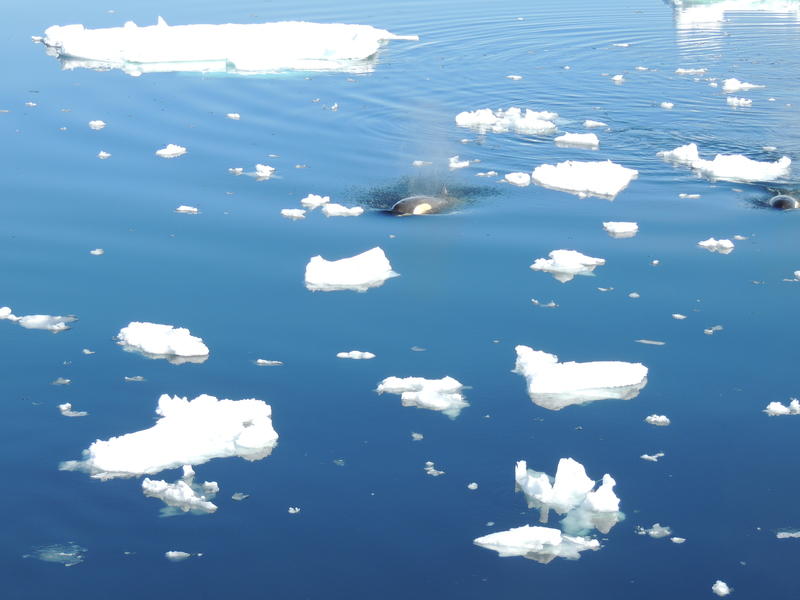 When I opened my porthole I immediately spotted a Crabeater Seal hanging out on the sea ice. 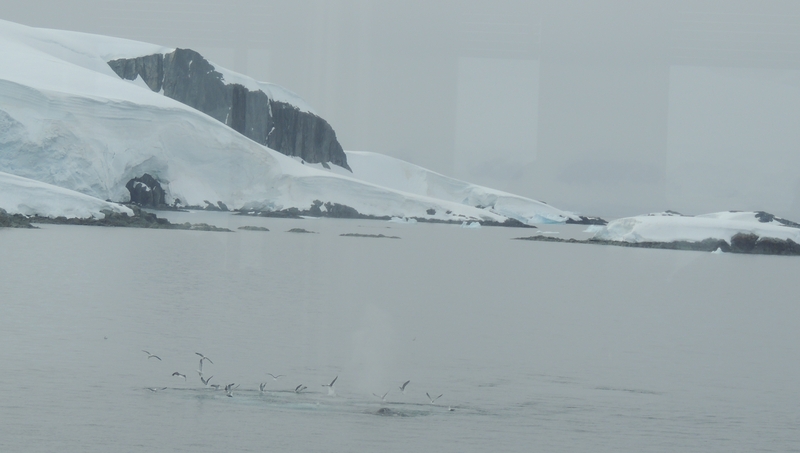 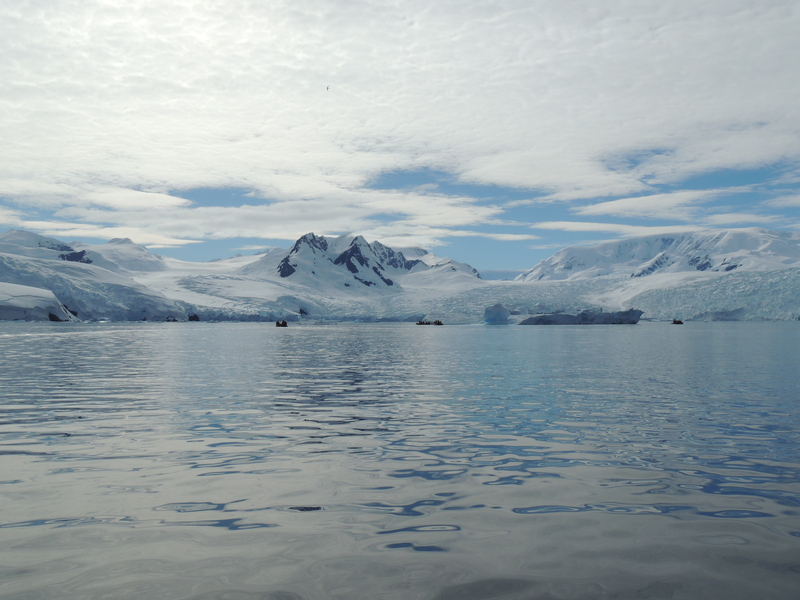 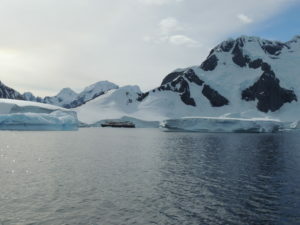 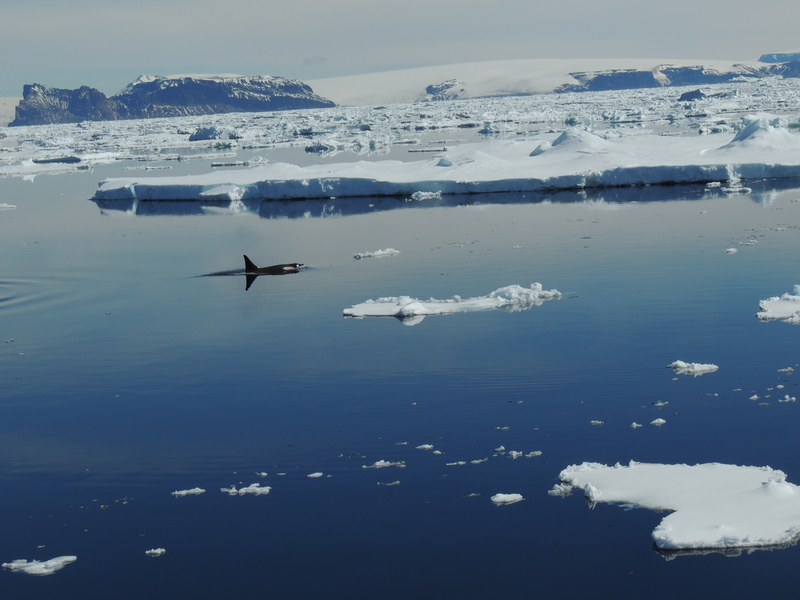 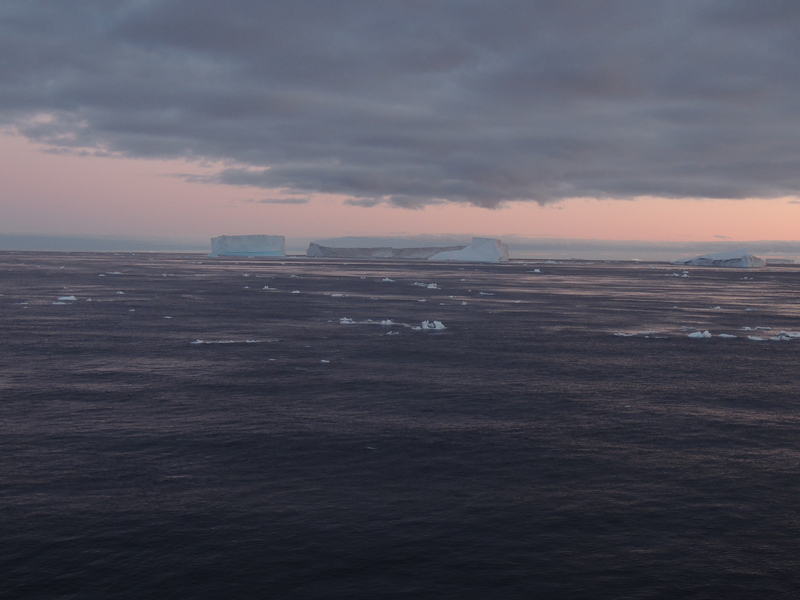 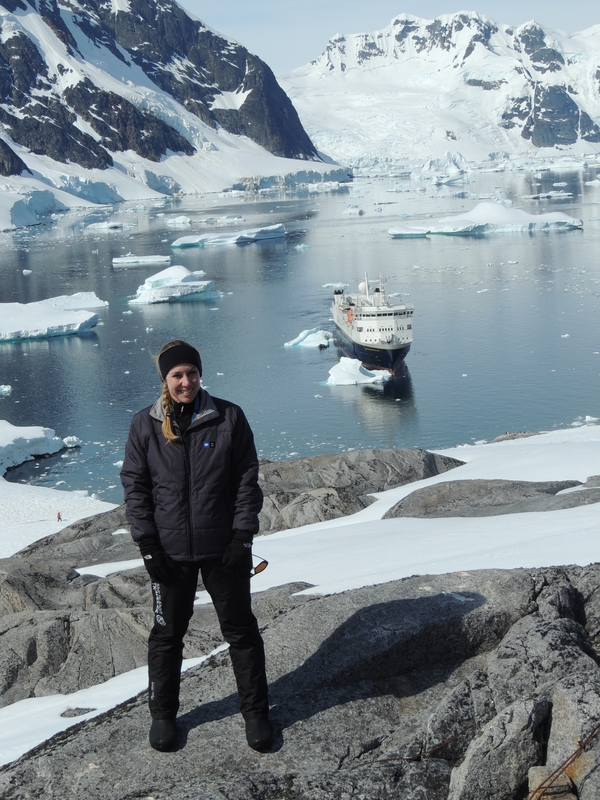 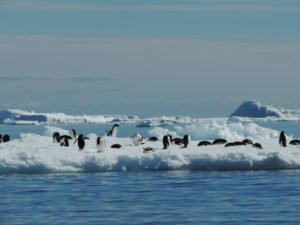 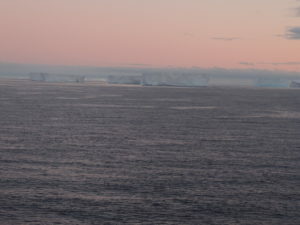 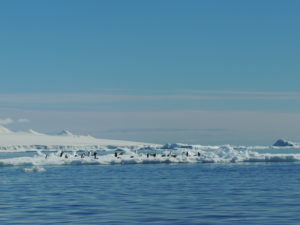 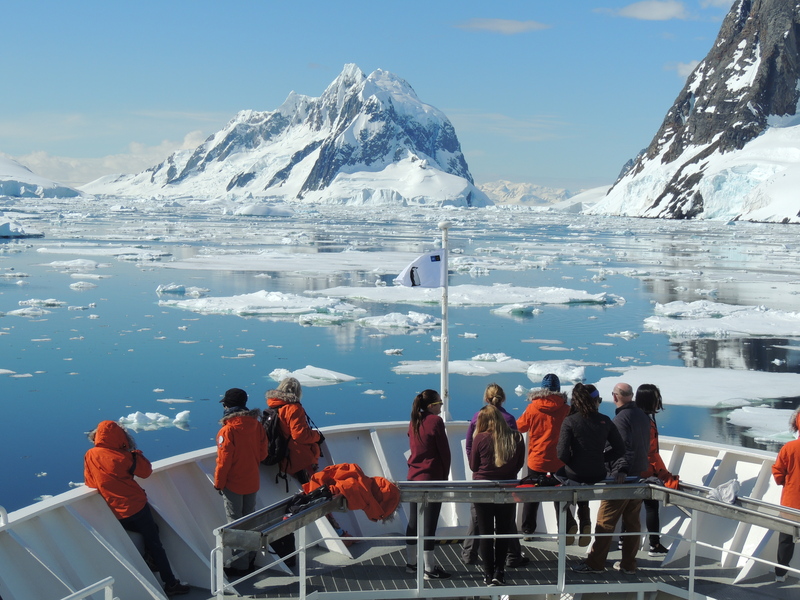 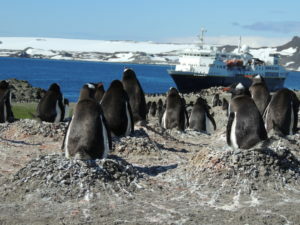 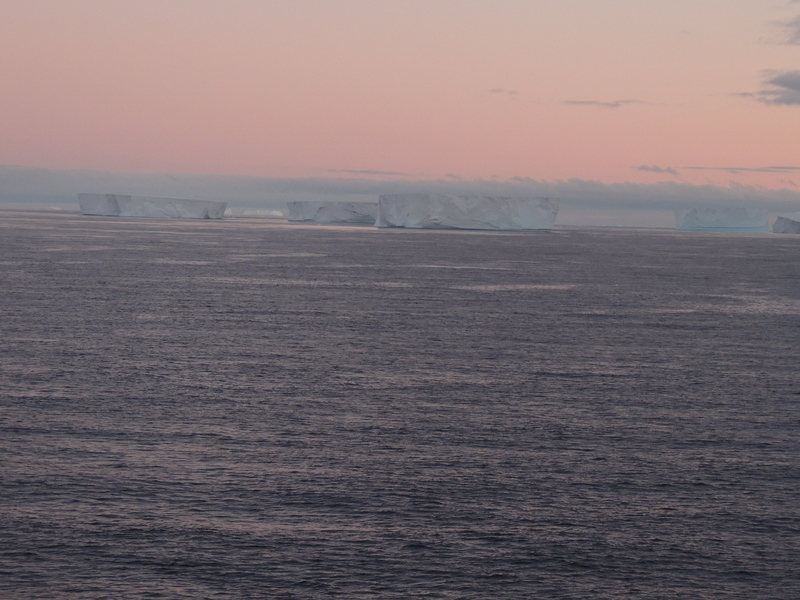 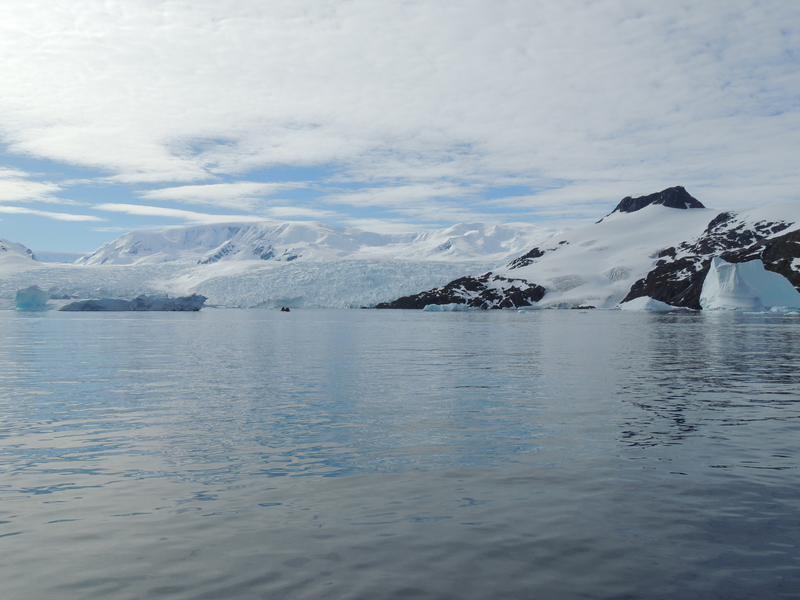 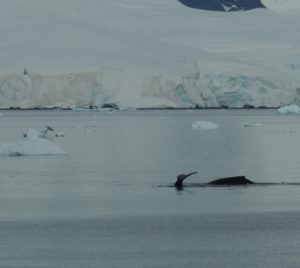 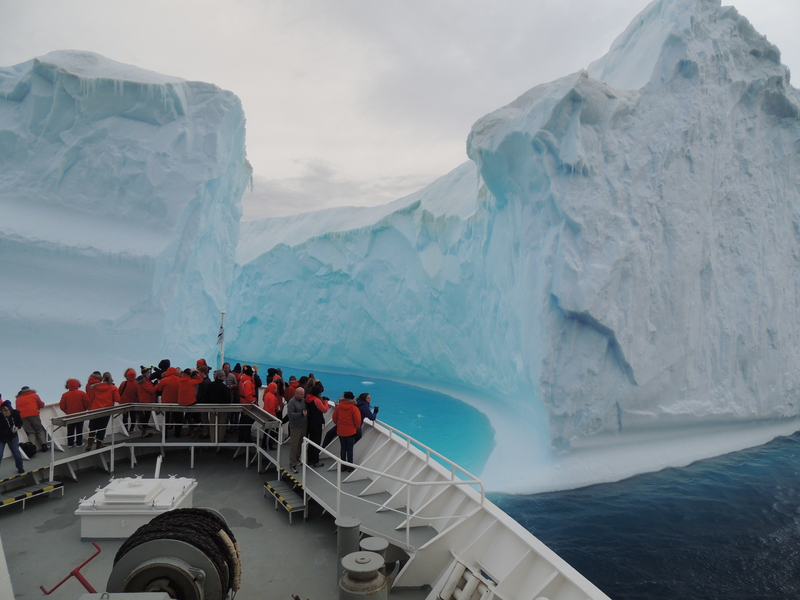 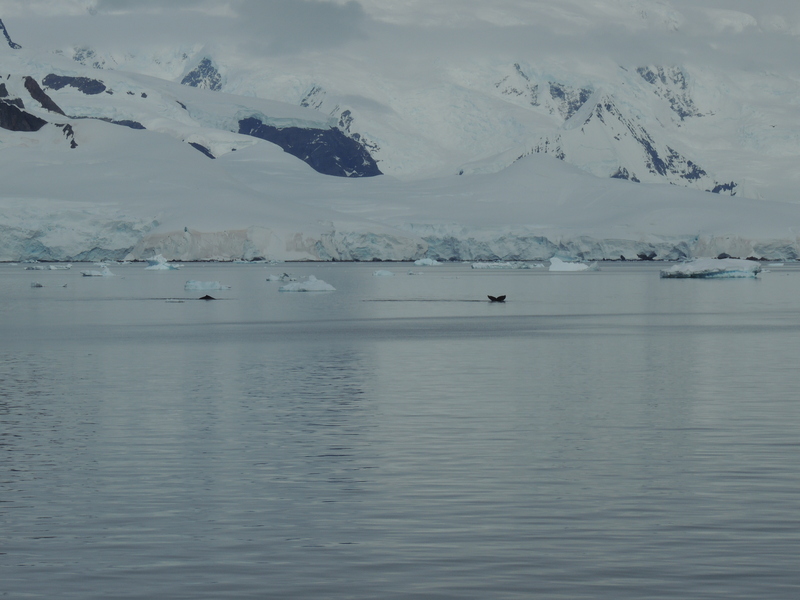 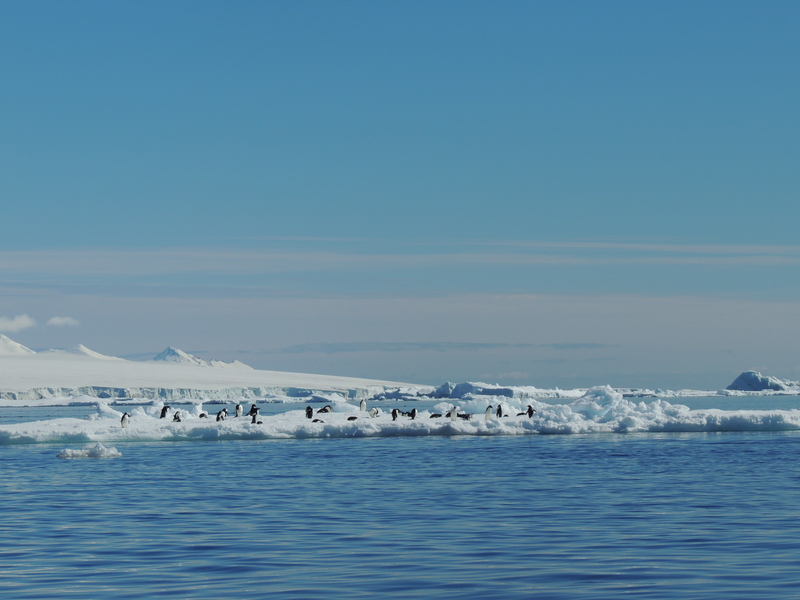 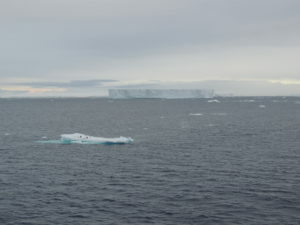 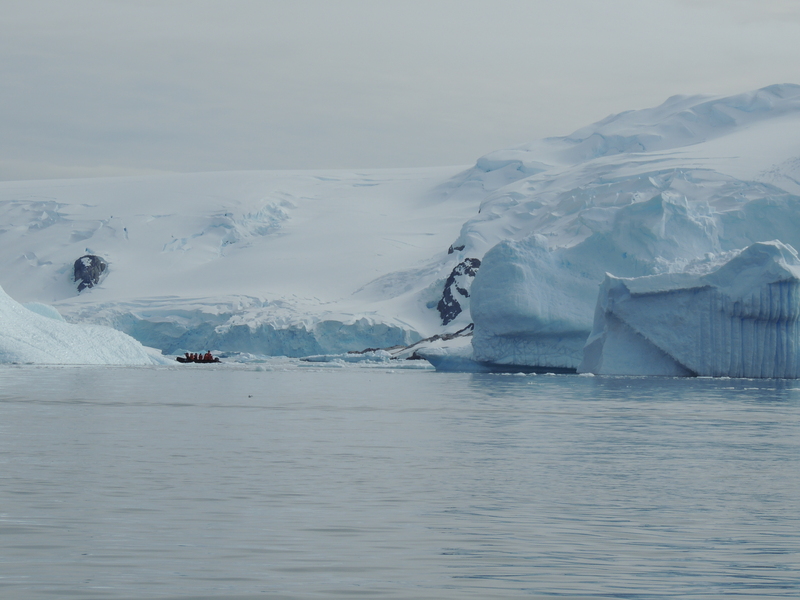 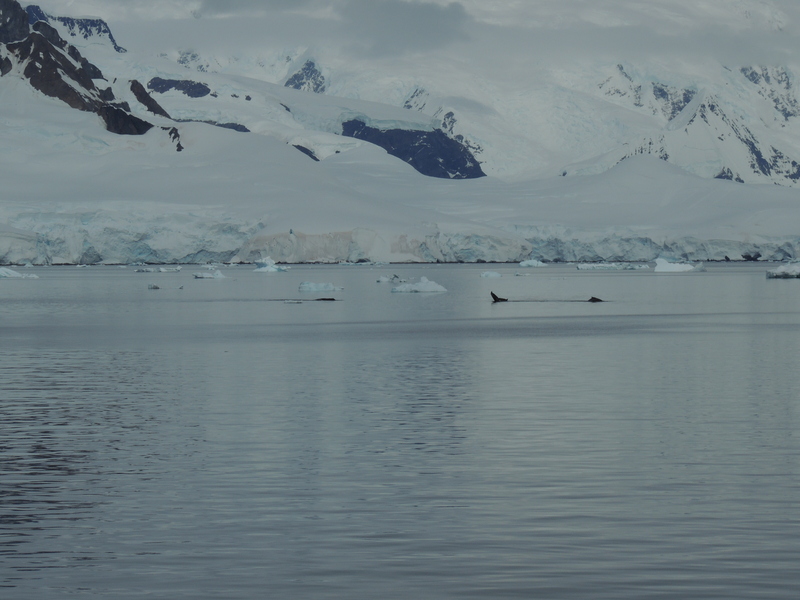 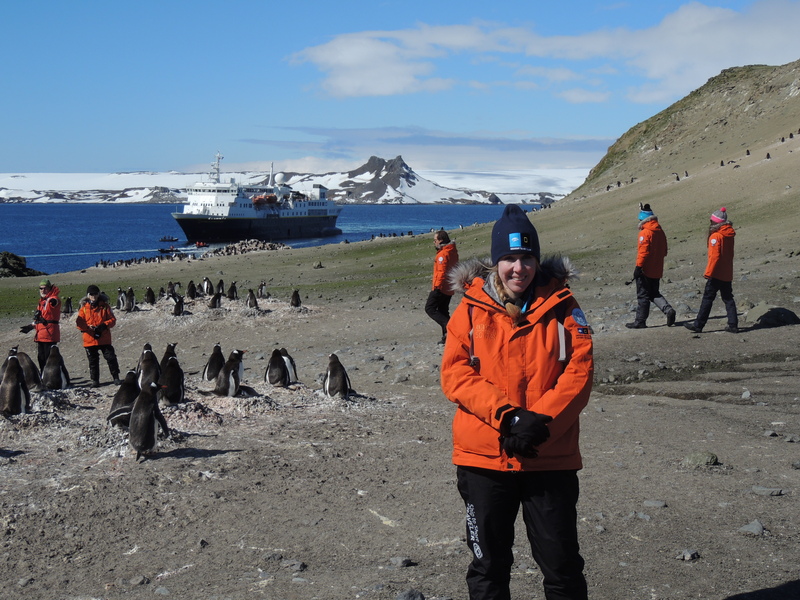 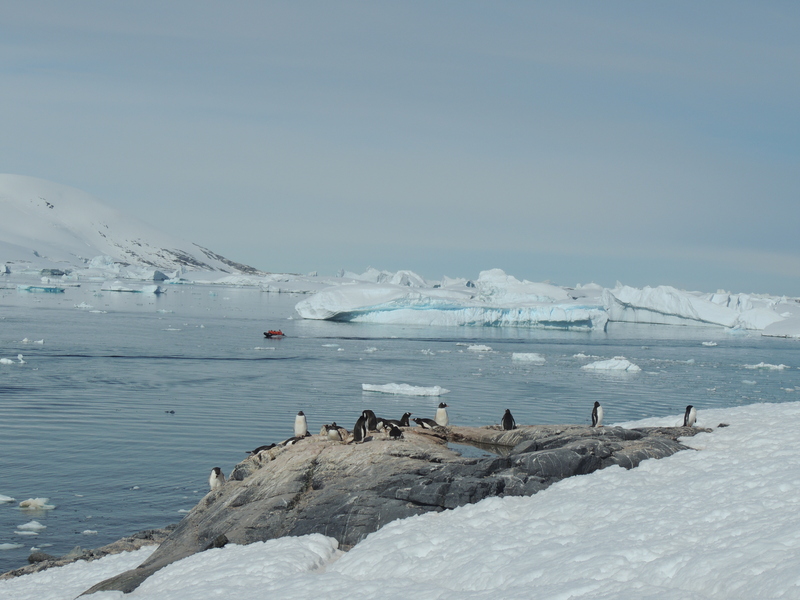 As the ship traveled we passed several lounging Crabeater Seals and lots of early morning frolicking penguins out the window before breakfast! 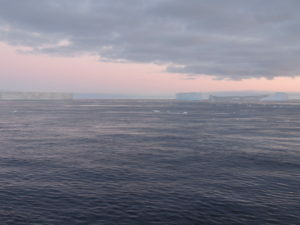 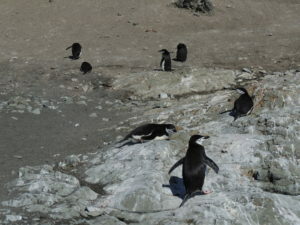 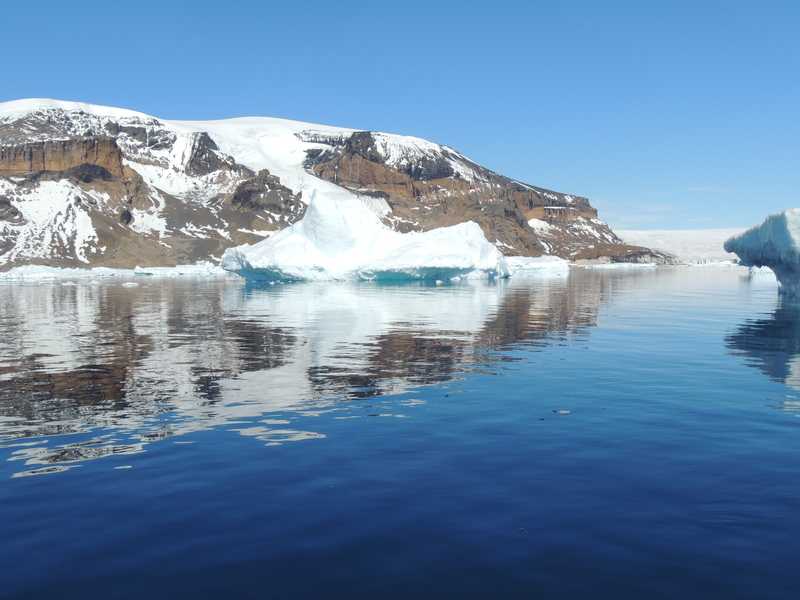 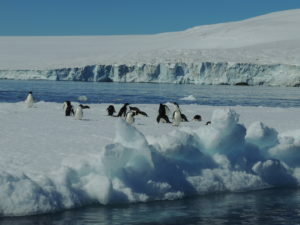 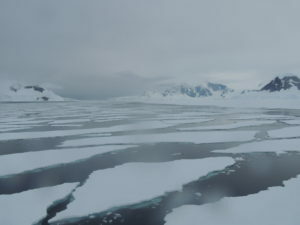 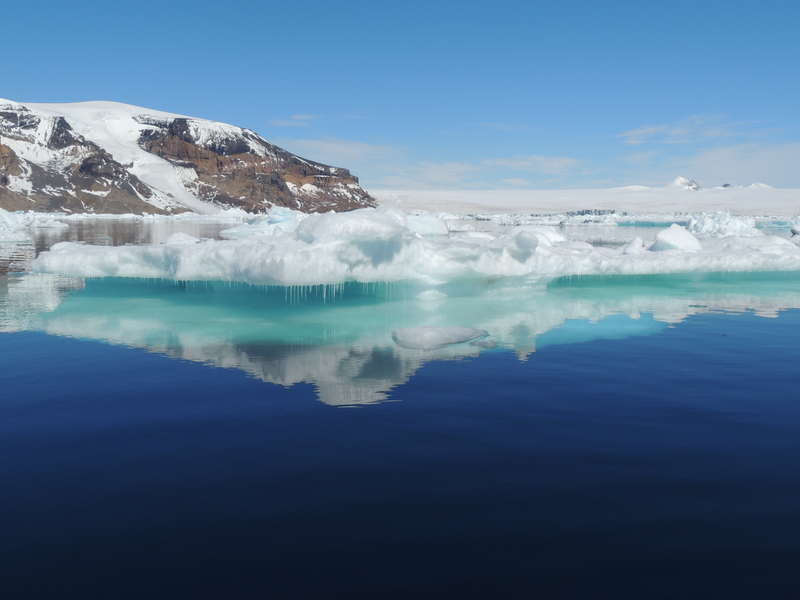 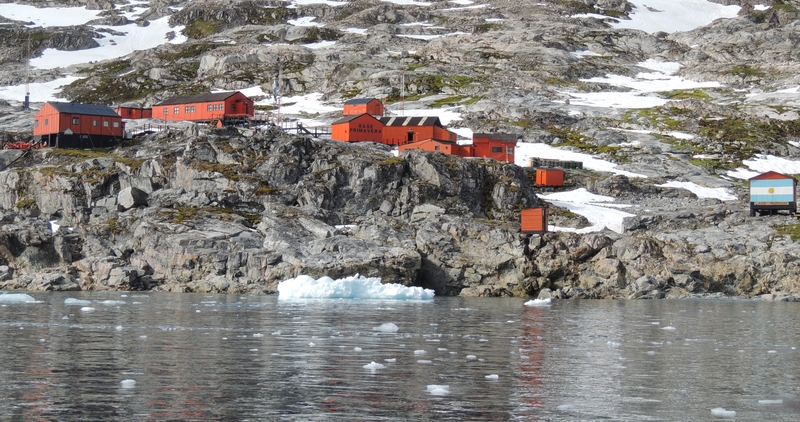 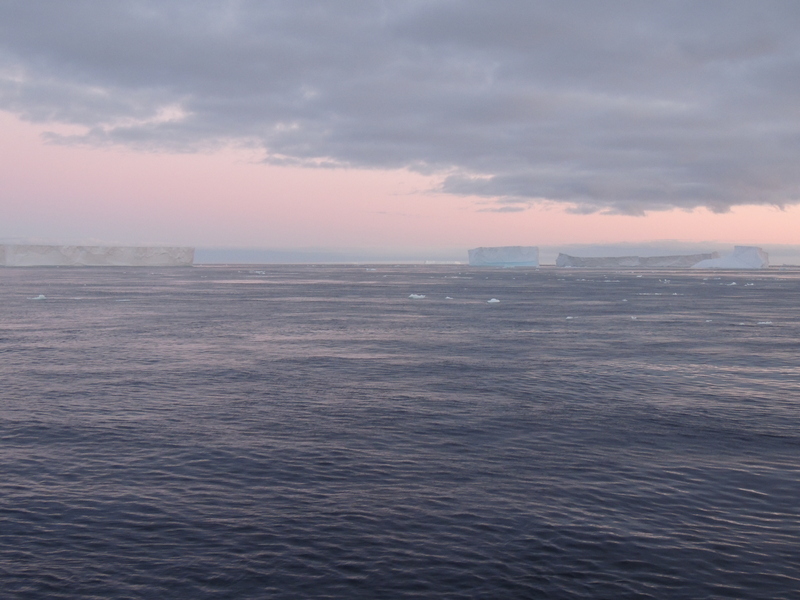 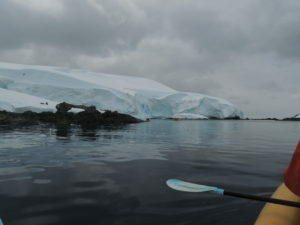 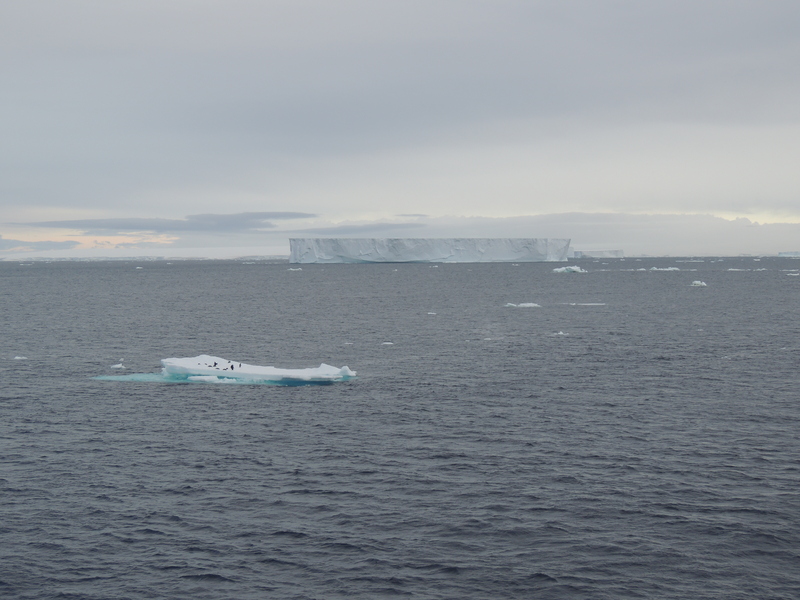 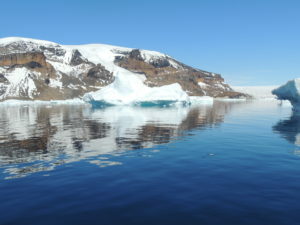 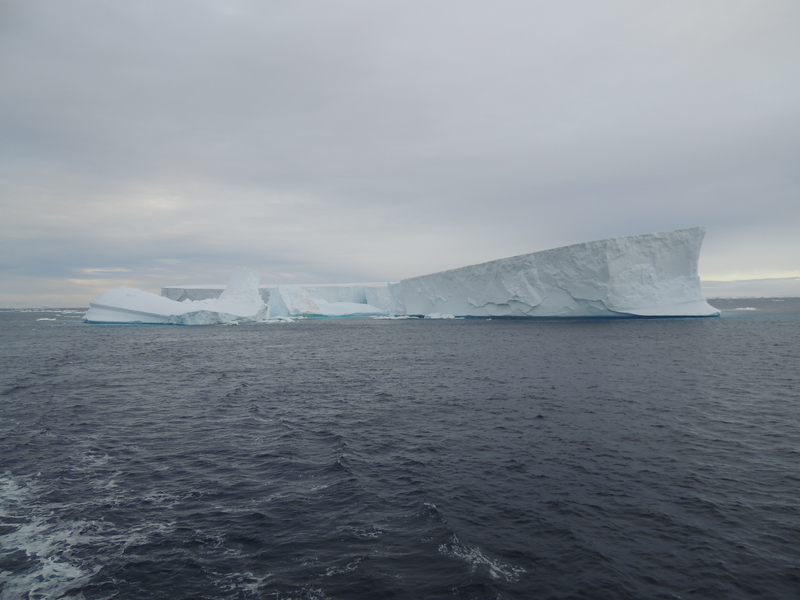 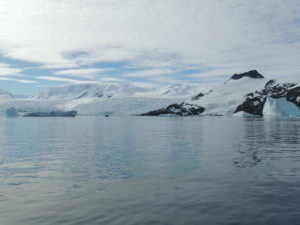 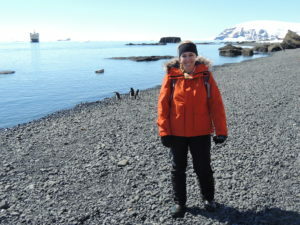 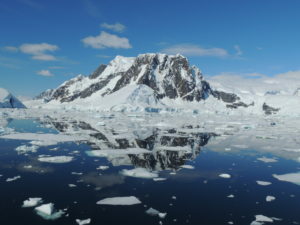 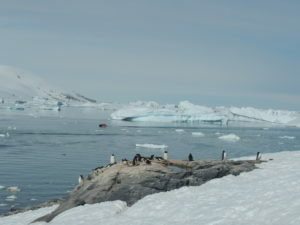 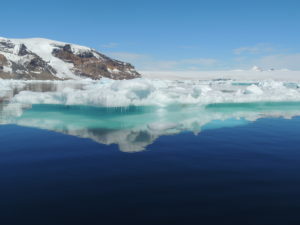 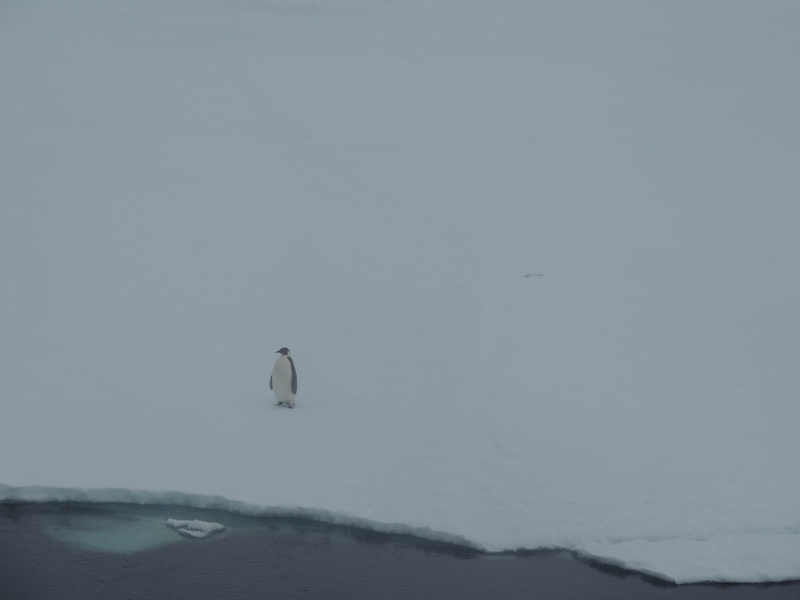 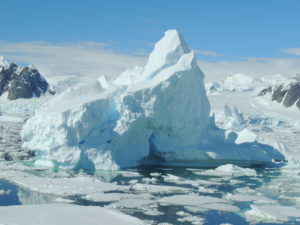 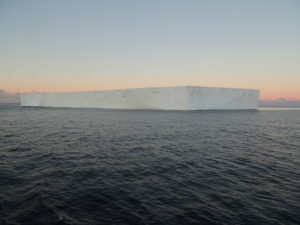 We landed at Booth Island directly south of the Lemaire Channel. 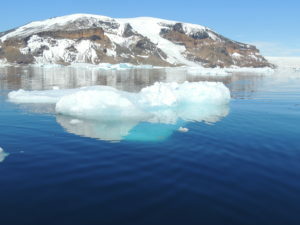 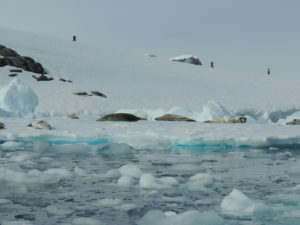 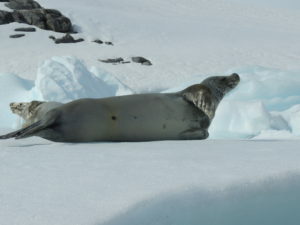 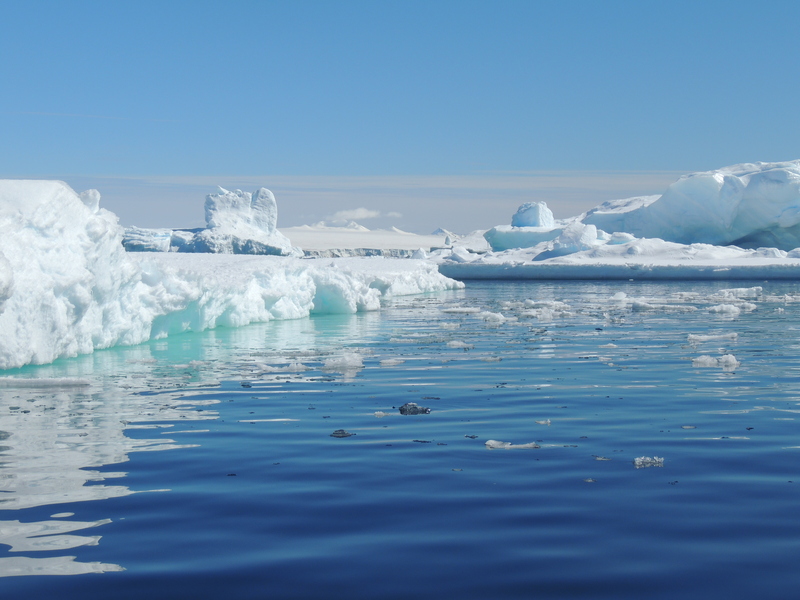 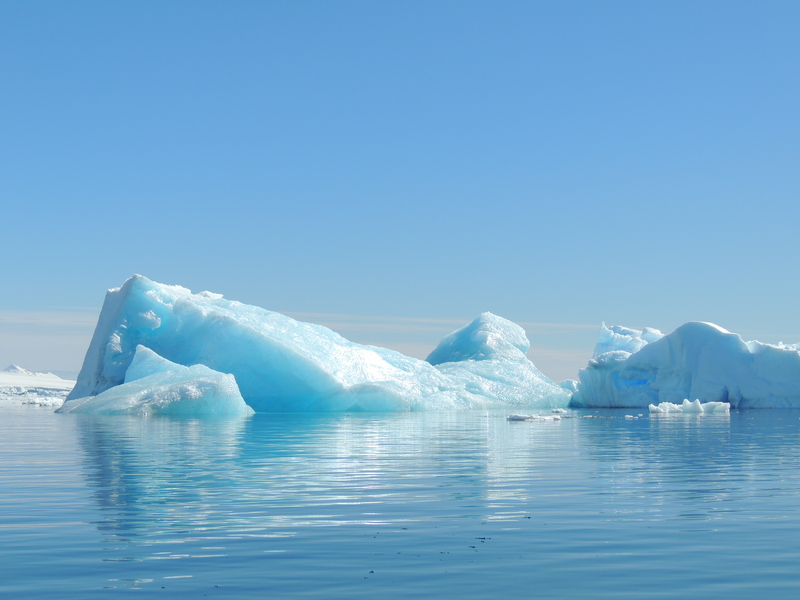 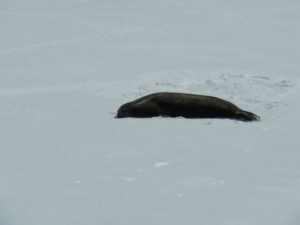 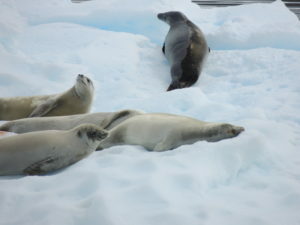 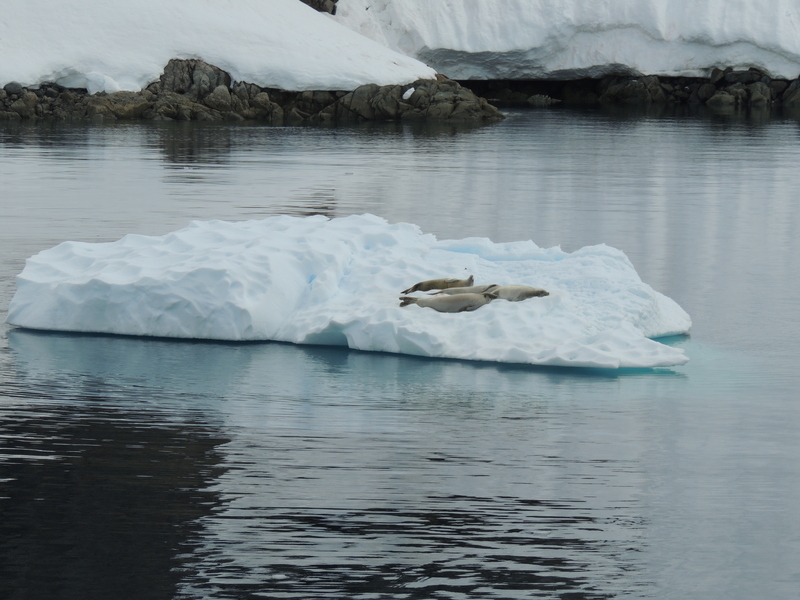 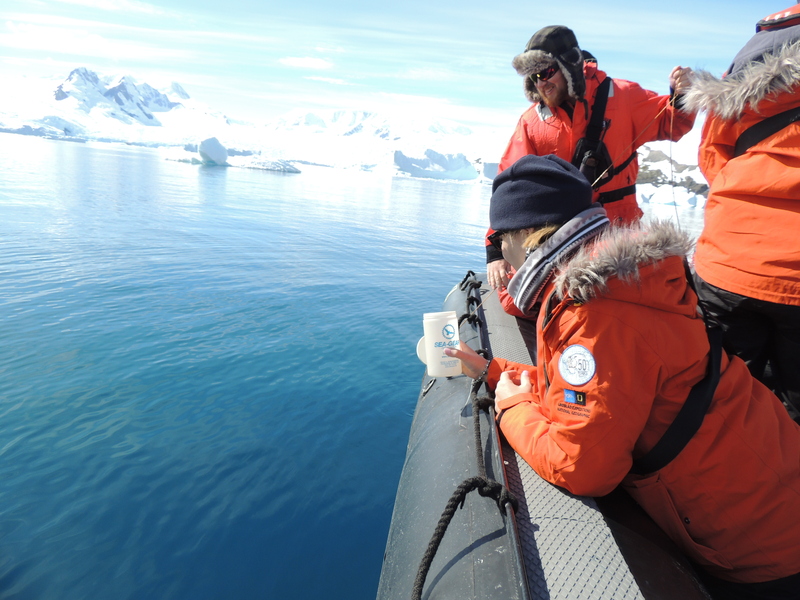 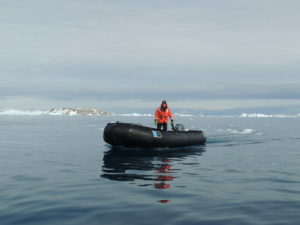 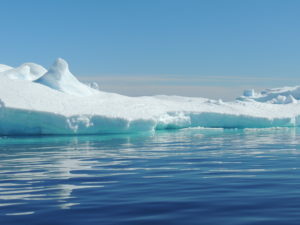 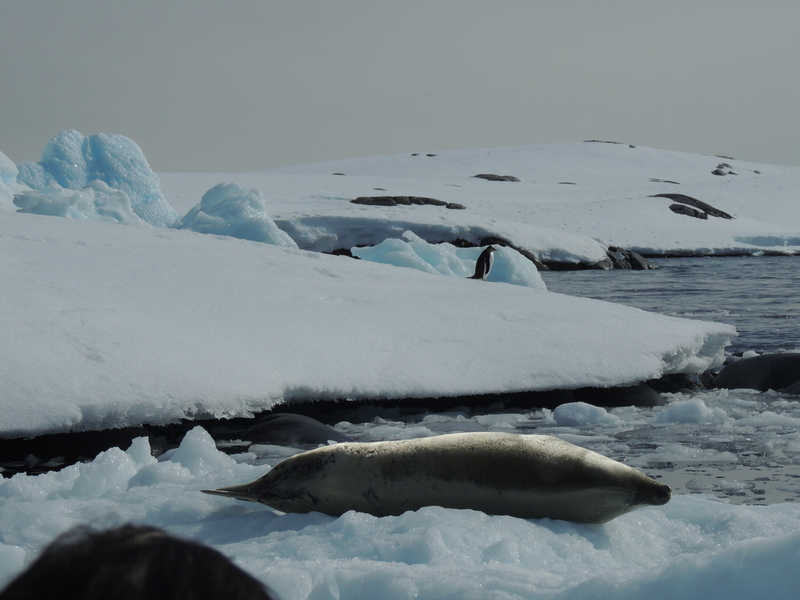 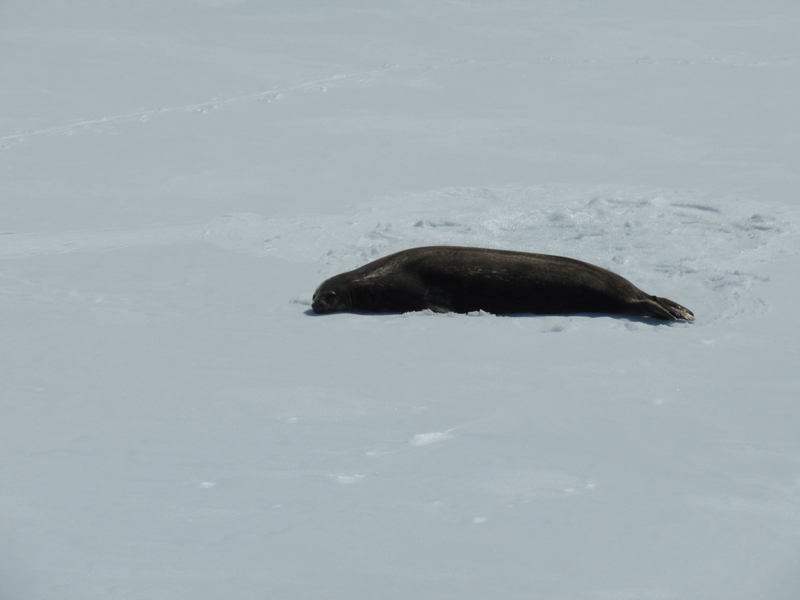 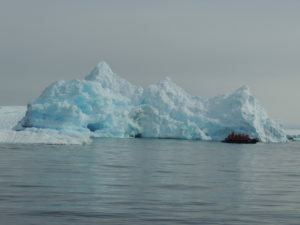 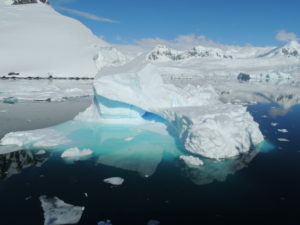 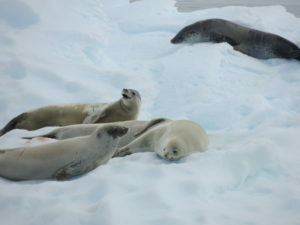 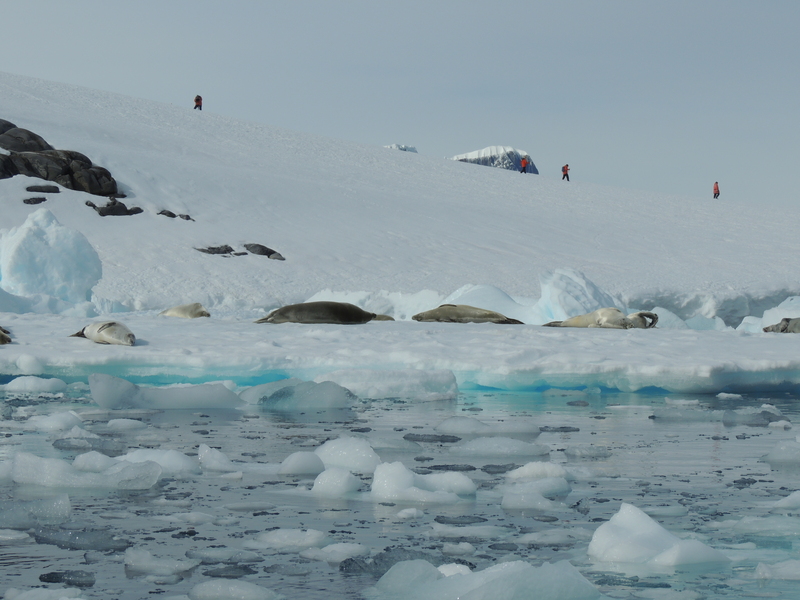 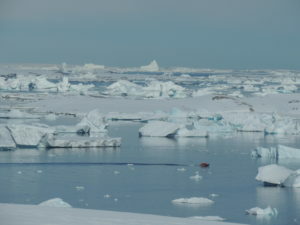 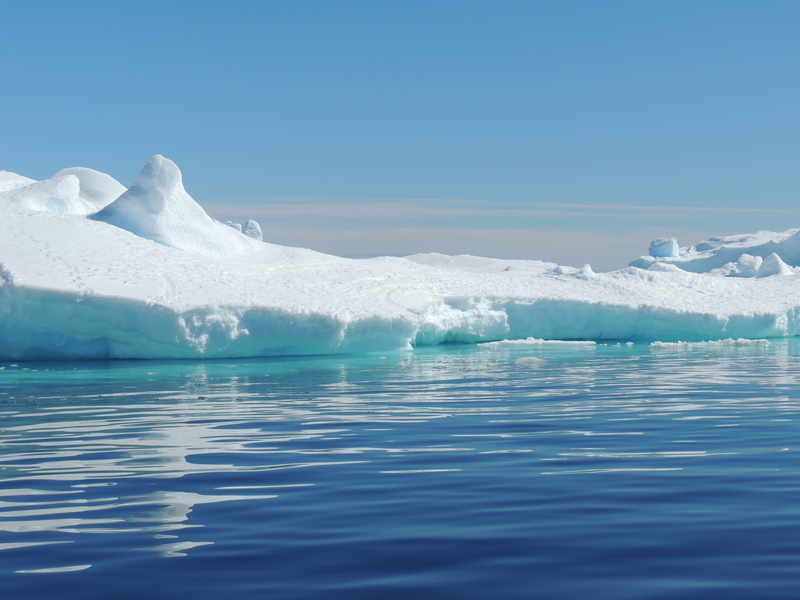 My first activity was a Zodiac tour among the ice floes where we saw lots of Crabeater seals sunning themselves on top of the ice. 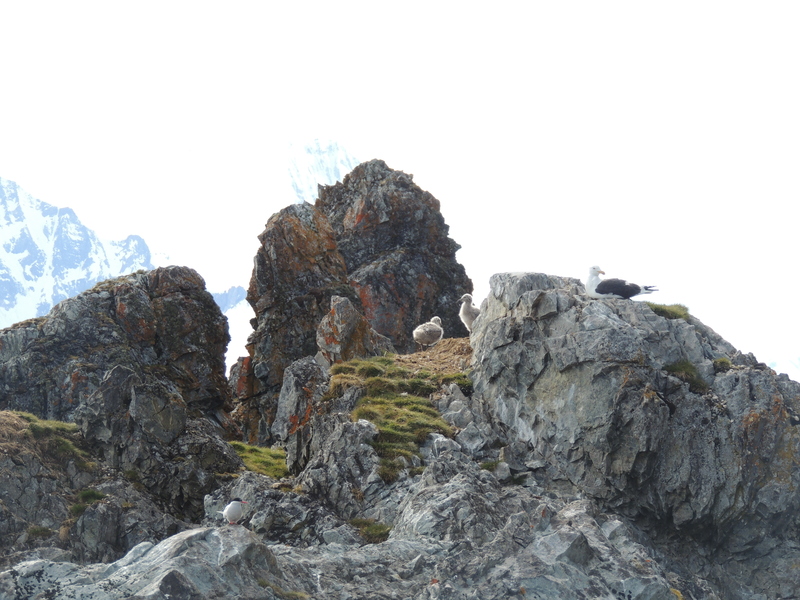 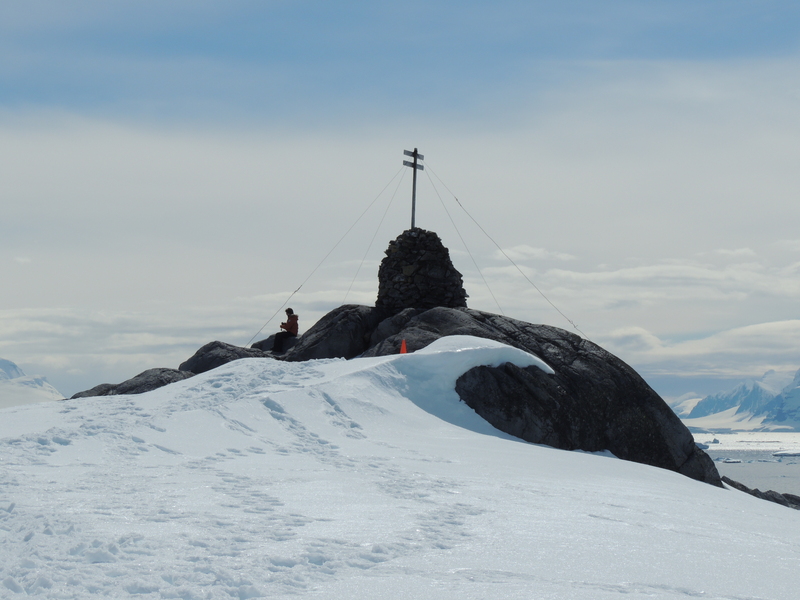 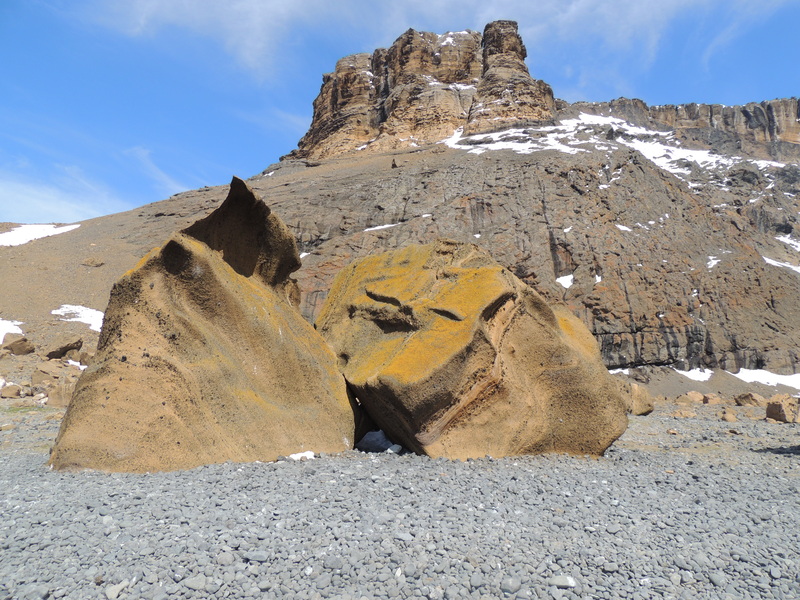 After touring Port Charcot we hiked to the cairn atop one of the mountains on Booth Island. 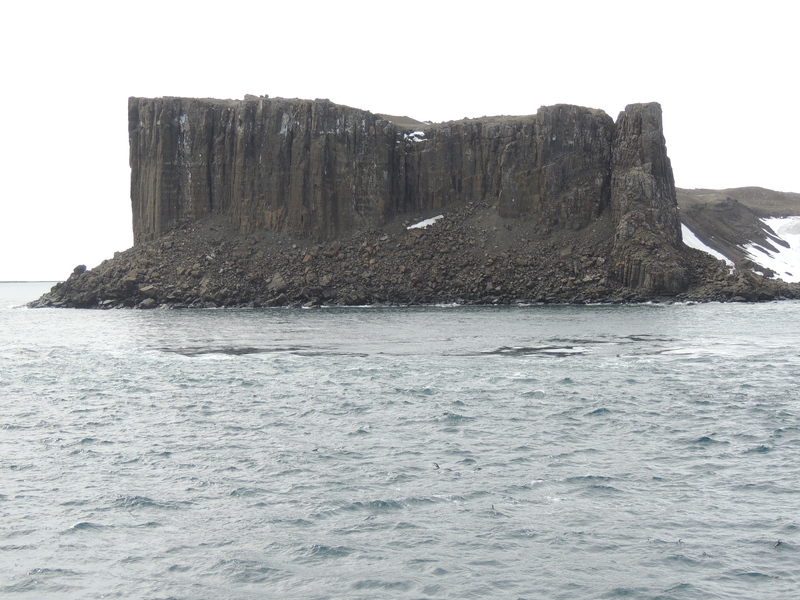 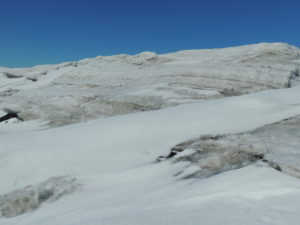 The cairn was built by some early explorers who overwintered there. The cairn is over 100 years old and looks like it was built much more recently than that. 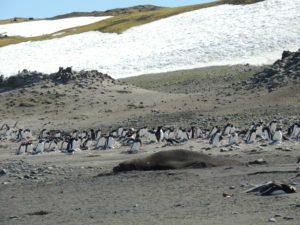 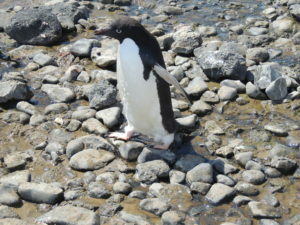 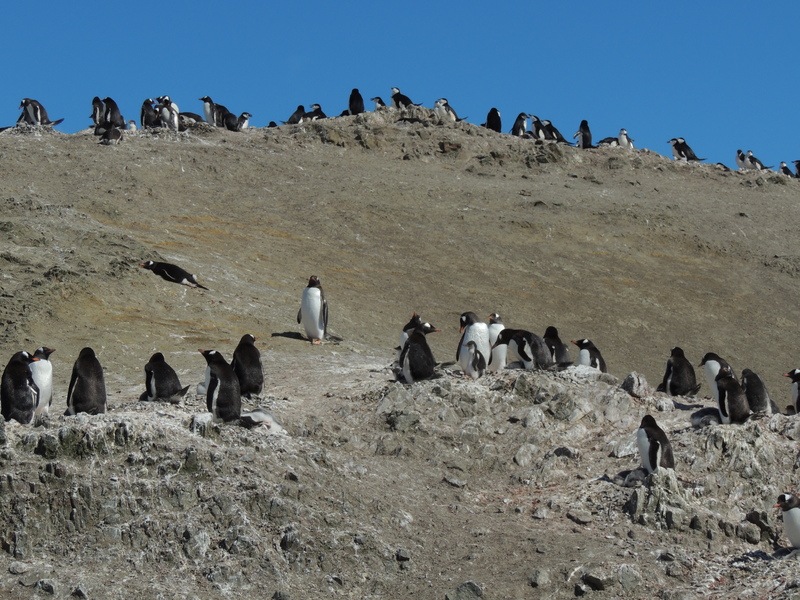 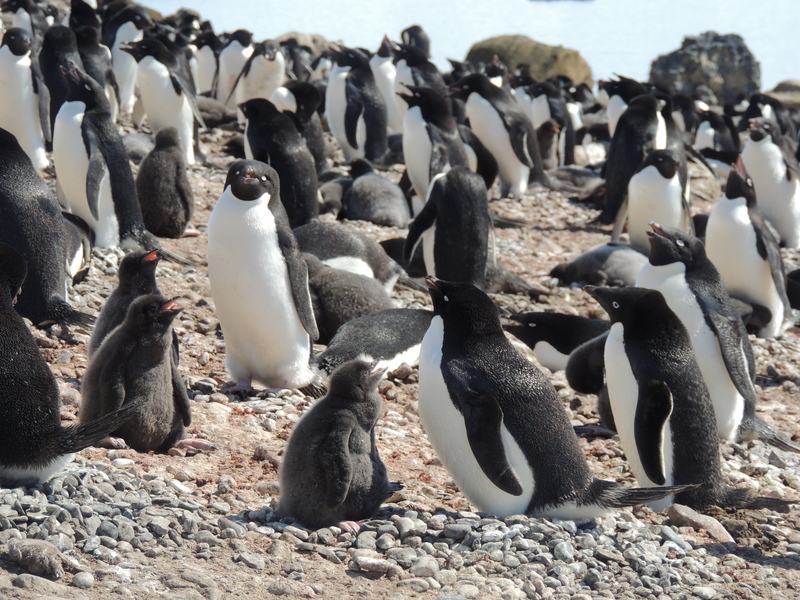 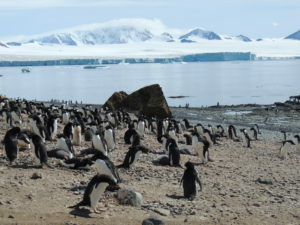 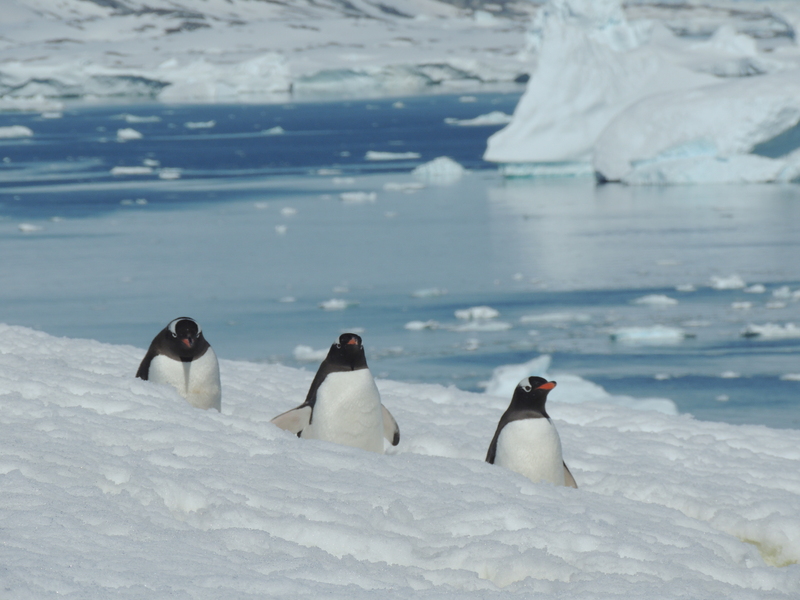 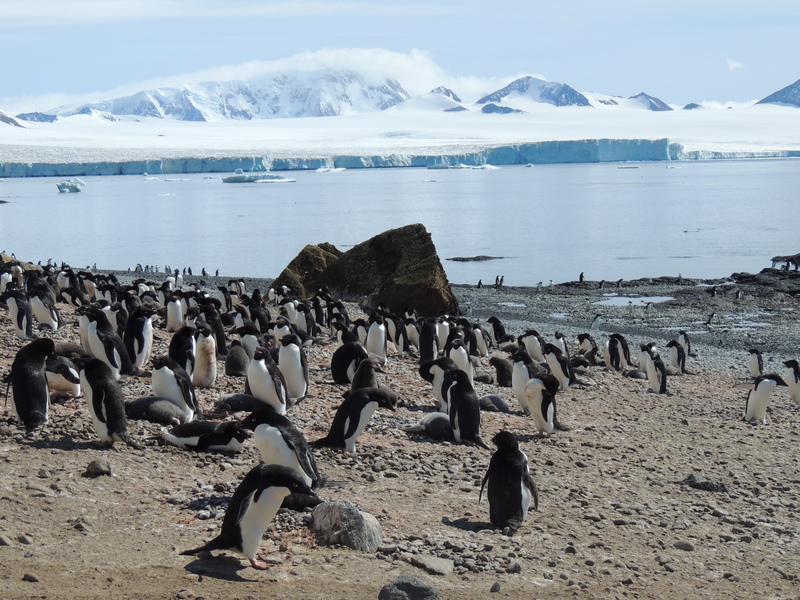 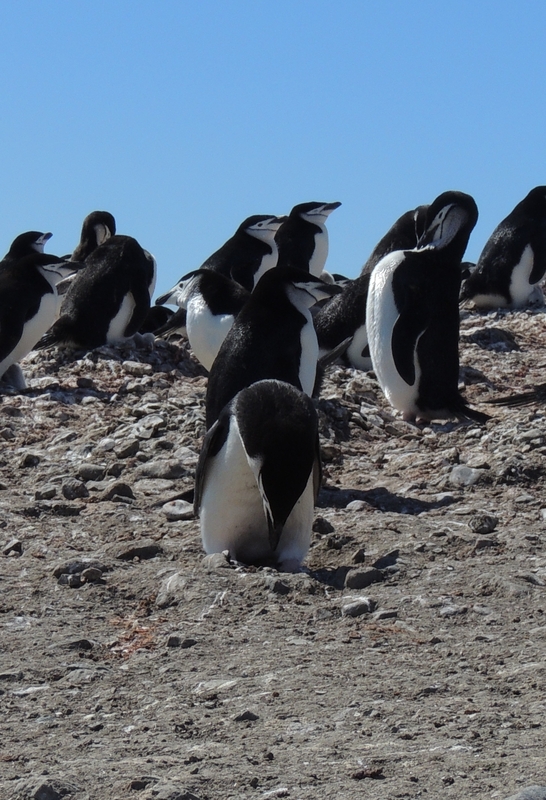 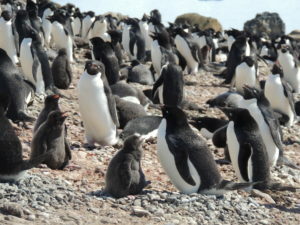 The Island is also home to Chinstrap, Adelie and Gentoo penguin colonies, though today I was most enthralled by the Gentoos as they traveled their “penguin highways” between their rookeries and the sea. The majority of these penguins still had eggs in their nests since we are much further south today than our previous penguin colony visits. 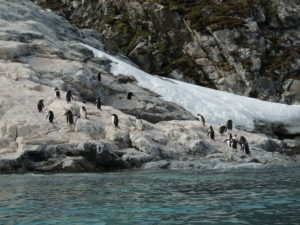 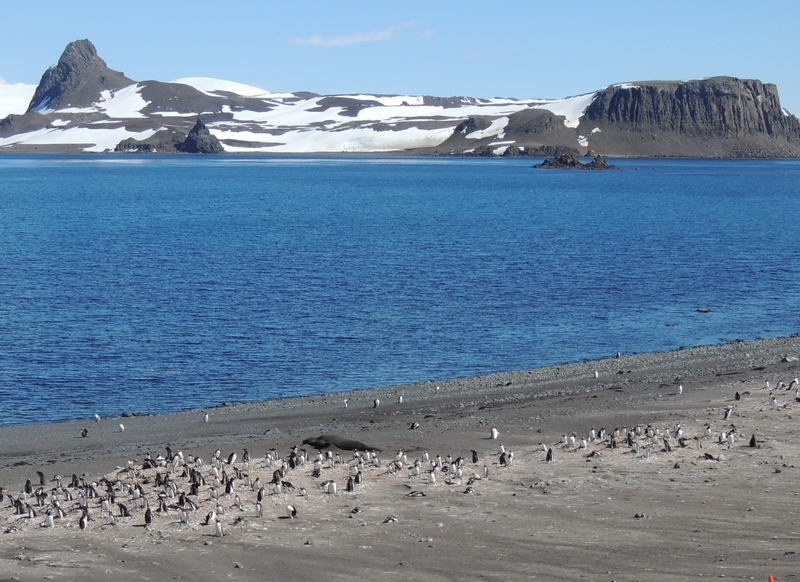 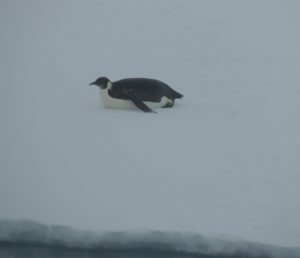 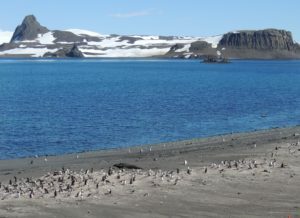 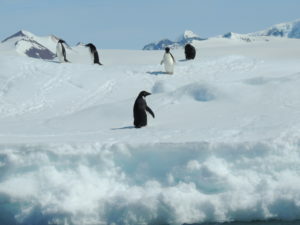 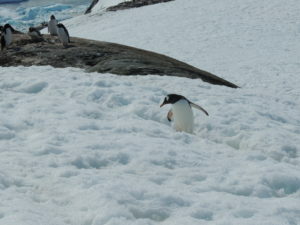 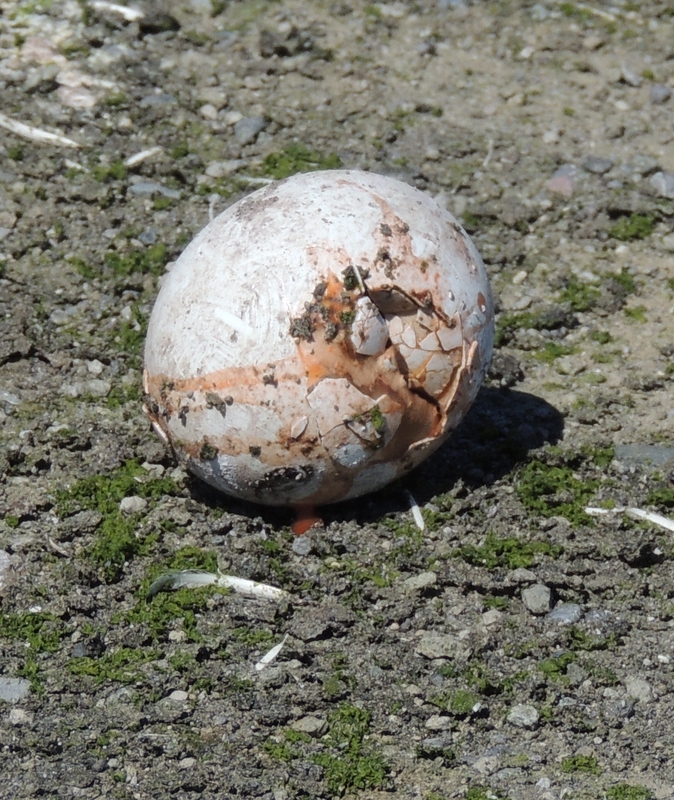 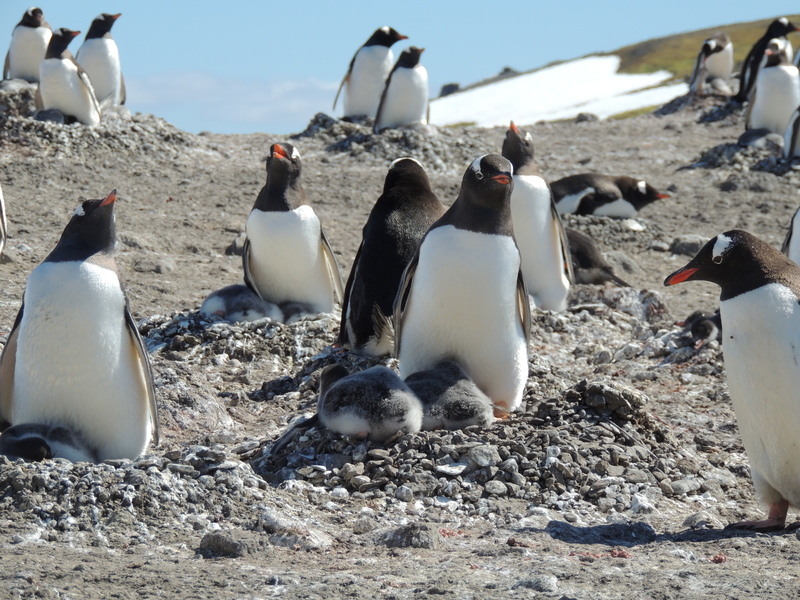 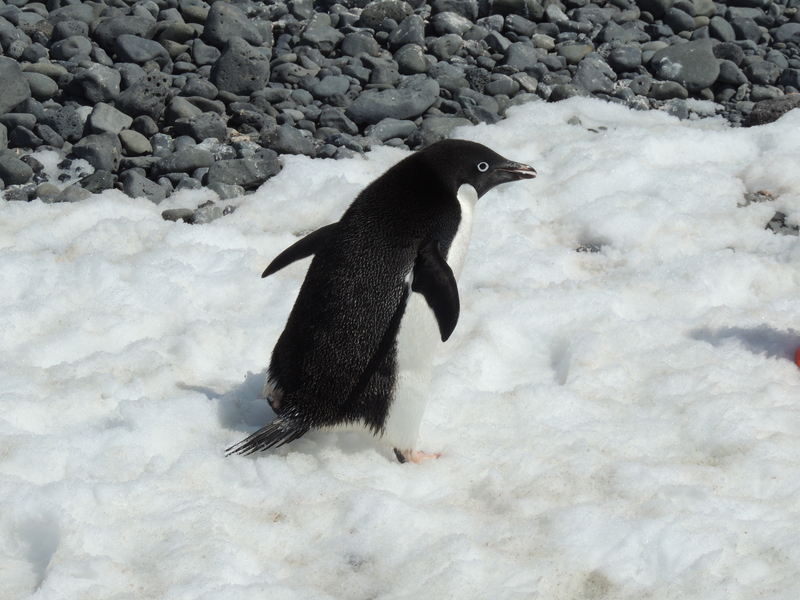 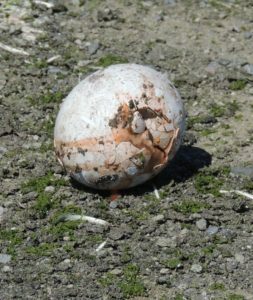 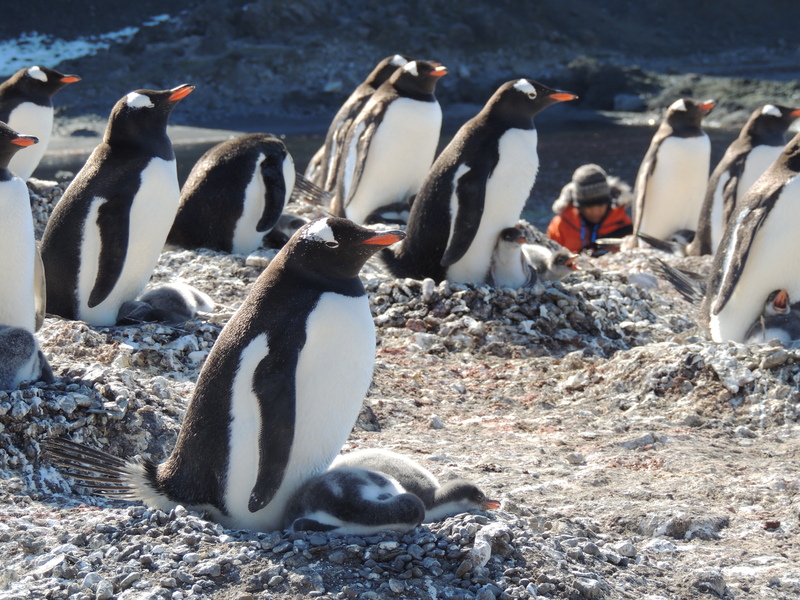 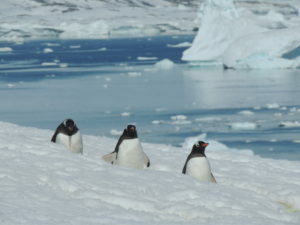 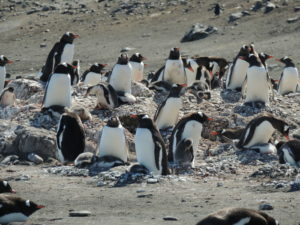 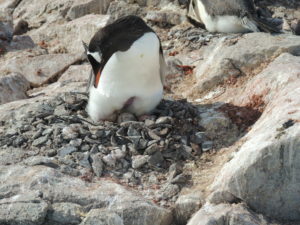 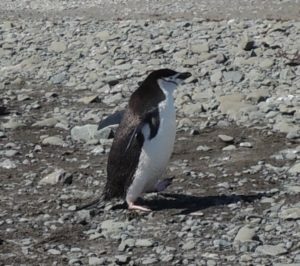 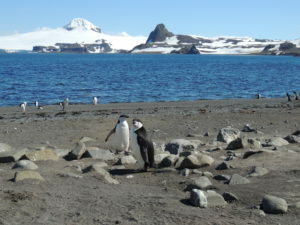 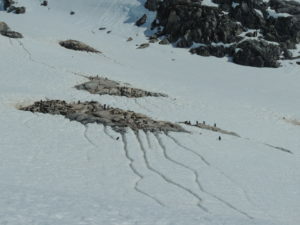 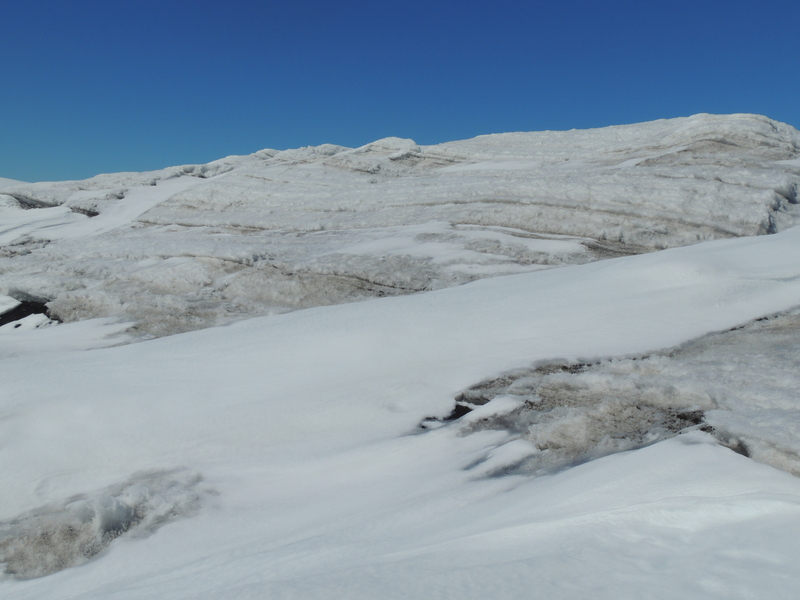 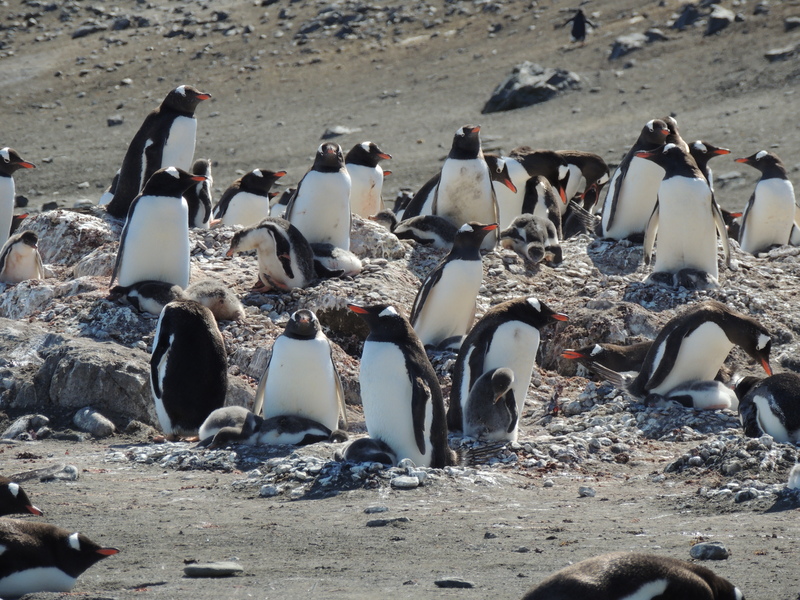 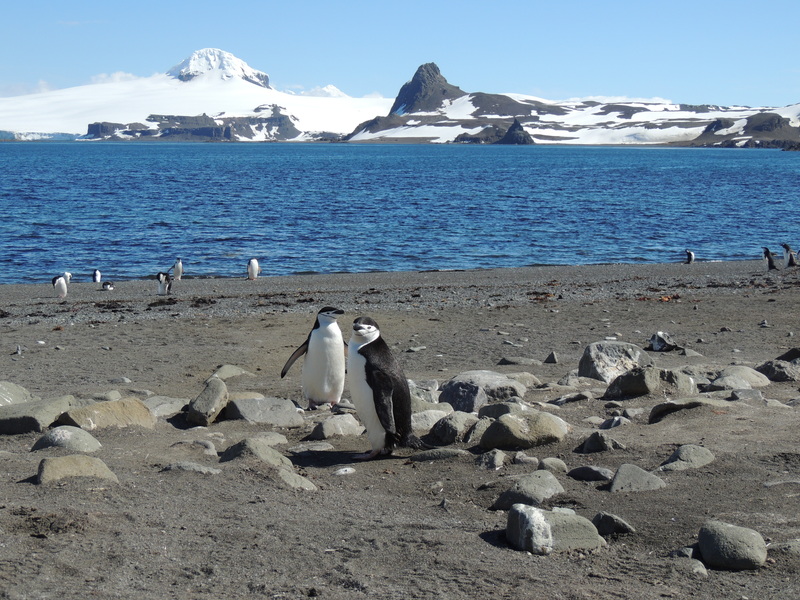 Since we are further south, the snow and ice melt much later so the penguins start their breeding season a bit later, thus their eggs/chicks are younger than those in colonies further north. 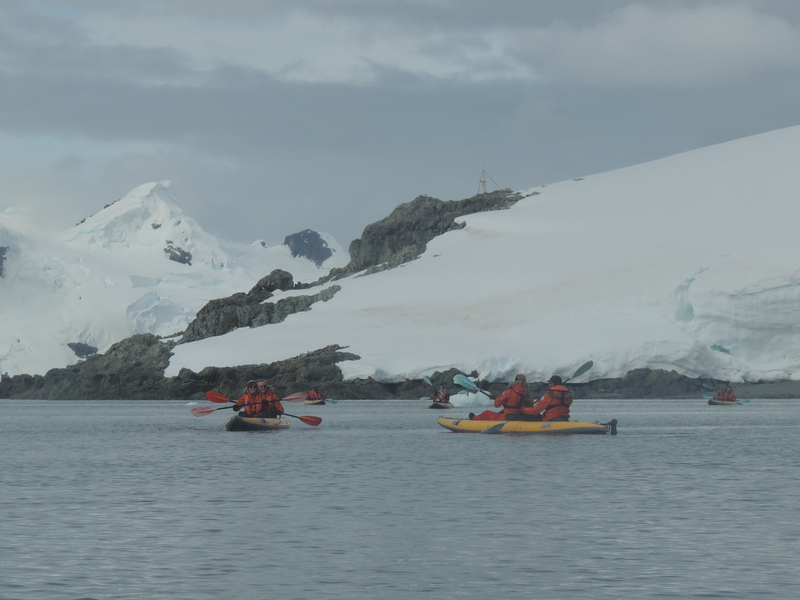 After lunch we ventured away from Antarctica a bit as National Geographic photographer Ken Garrett presented his current project about the ongoing search for Nefertiti. 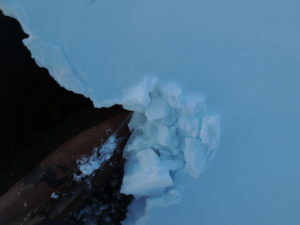 Ken has visited King Tut’s tomb numerous times and has taken several important photographs of Tut’s gilded death mask. Today Ken shared his experience with the search for the tomb of Nefertiti – and it is expected to be behind King Tut’s tomb. This was a nice break from the sensory overload of Antarctica and I am now on the hunt for Ken’s previous work with National Geographic. He’s heading out to photograph the next stage of the Nefertiti investigation later this month so keep an eye out for the finished product. 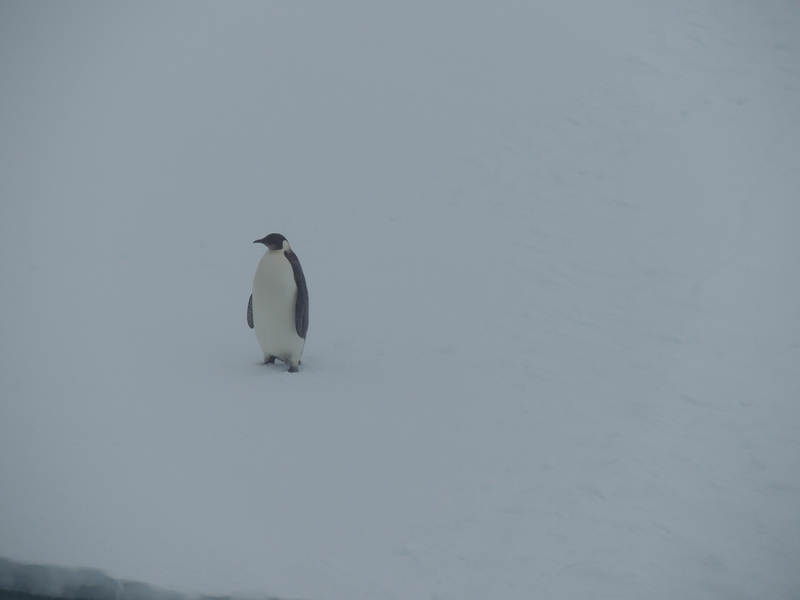 This afternoon, the Explorer ventured further south than she has been this season. 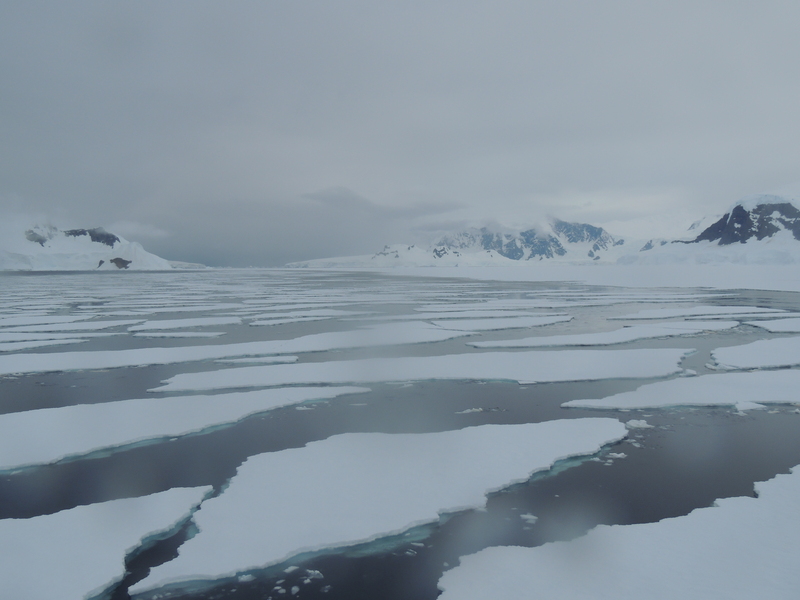 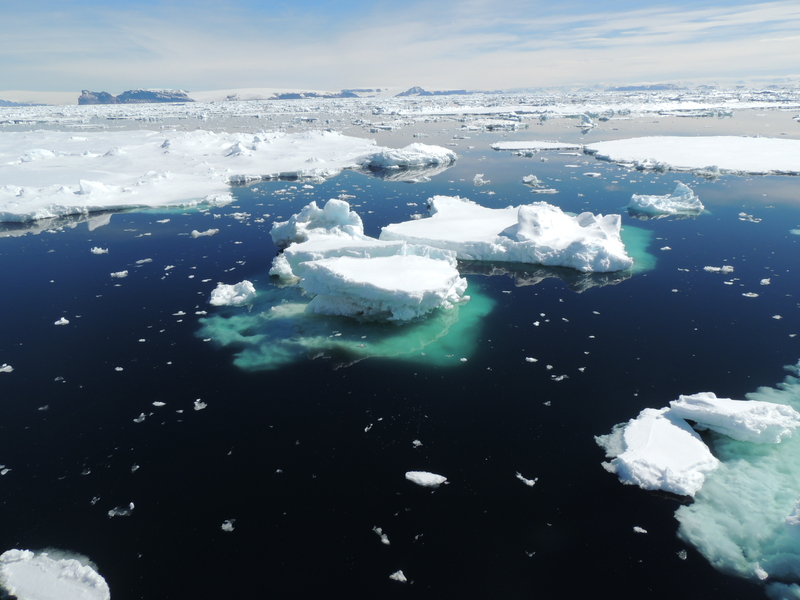 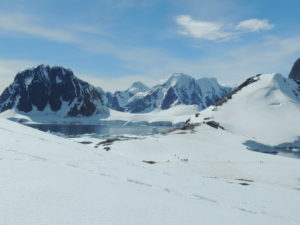 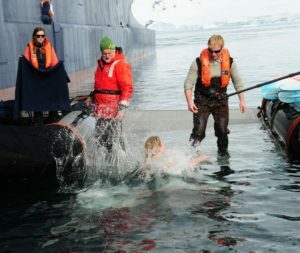 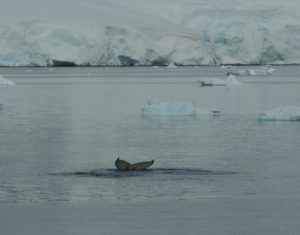 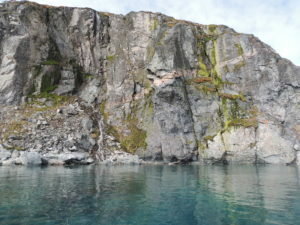 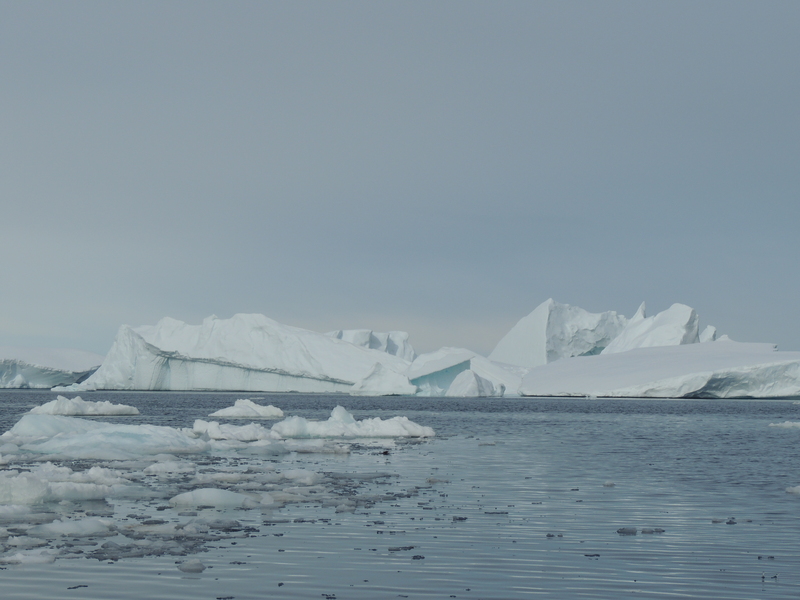 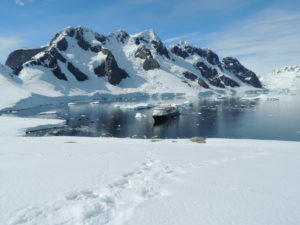 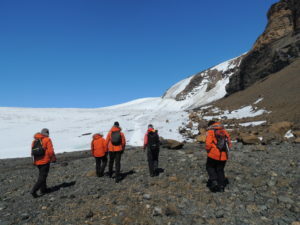 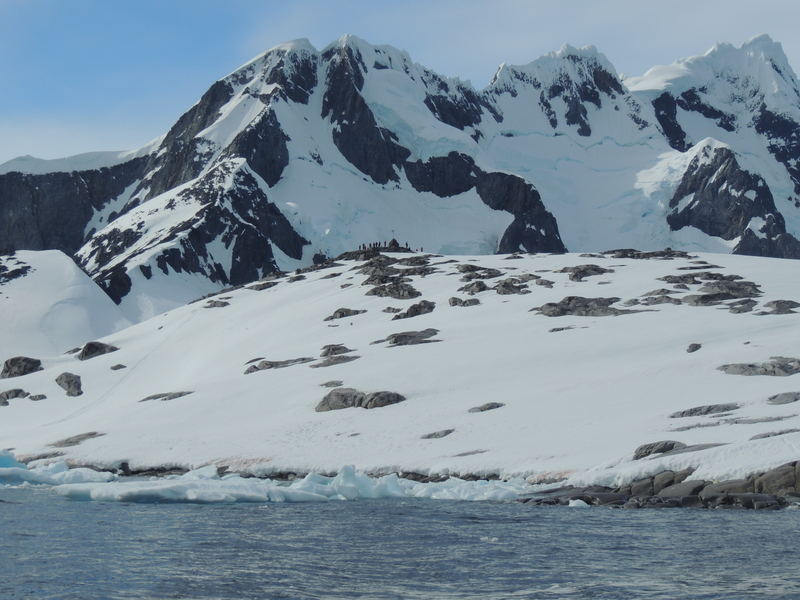 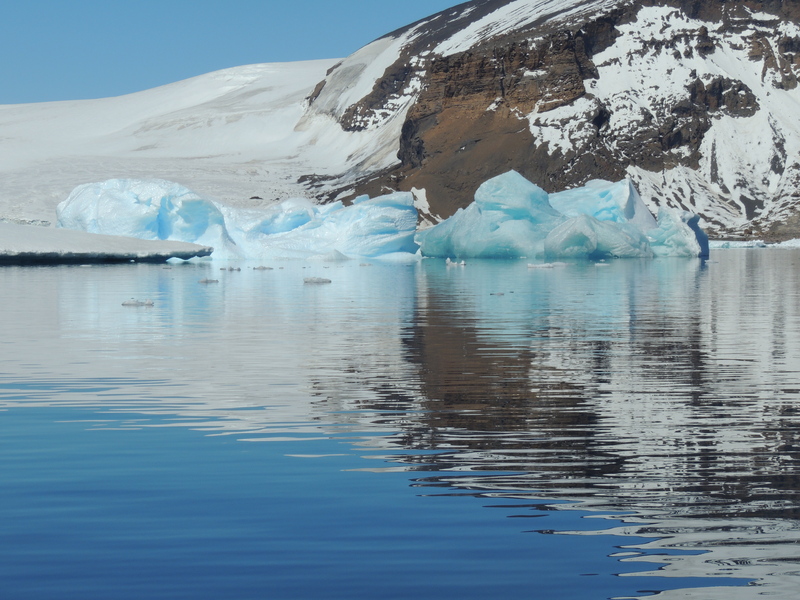 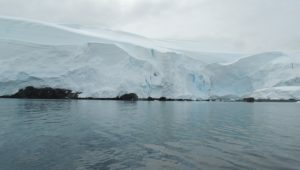 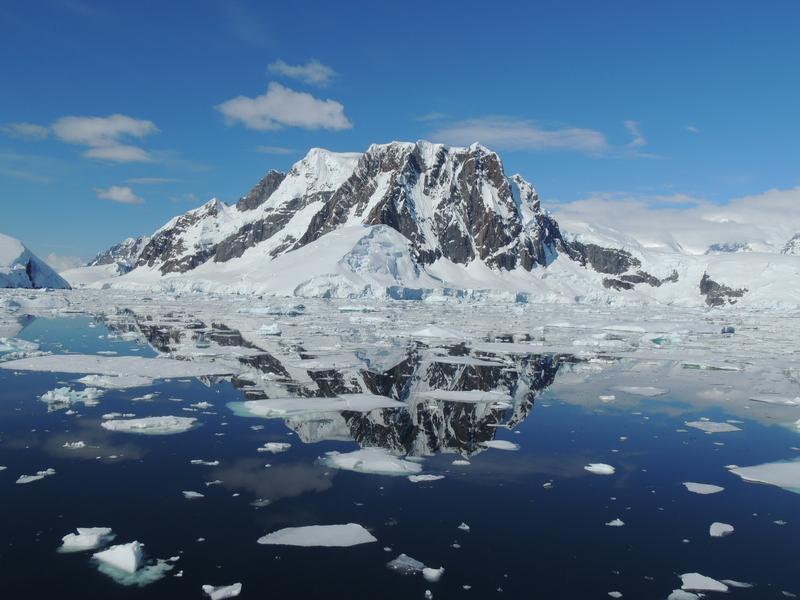 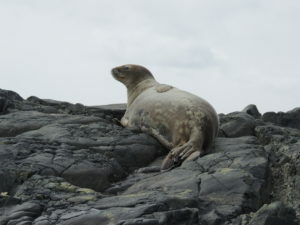 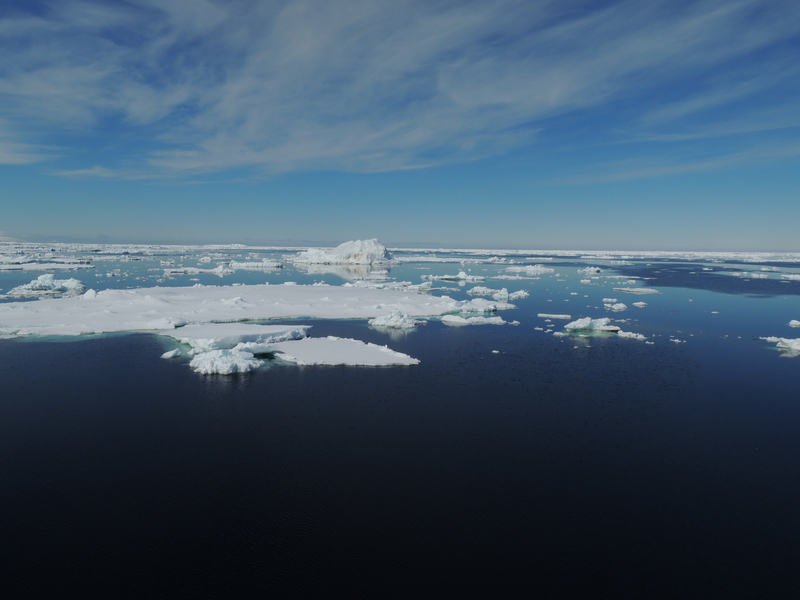 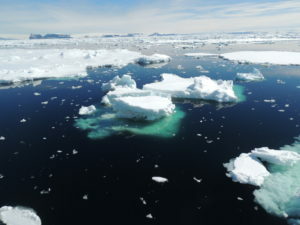 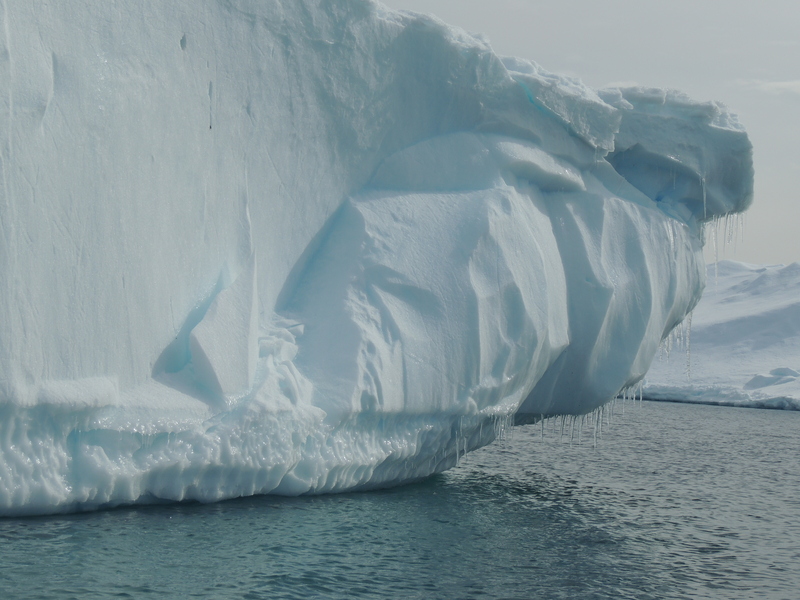 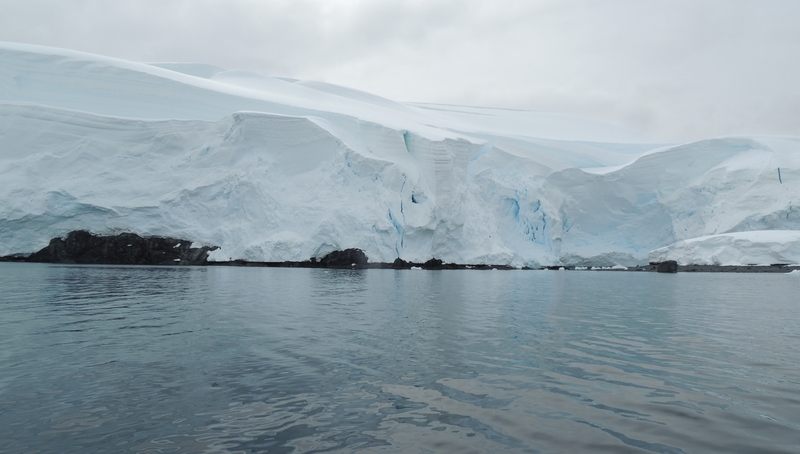 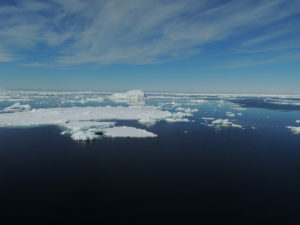 The ice prevented us from landing at our original destination (a Ukrainian base) but we were able to travel the beautiful Lemaire Channel where we saw lots of Crabeater seals and even the elusive, and carnivorous, Leopard seal. 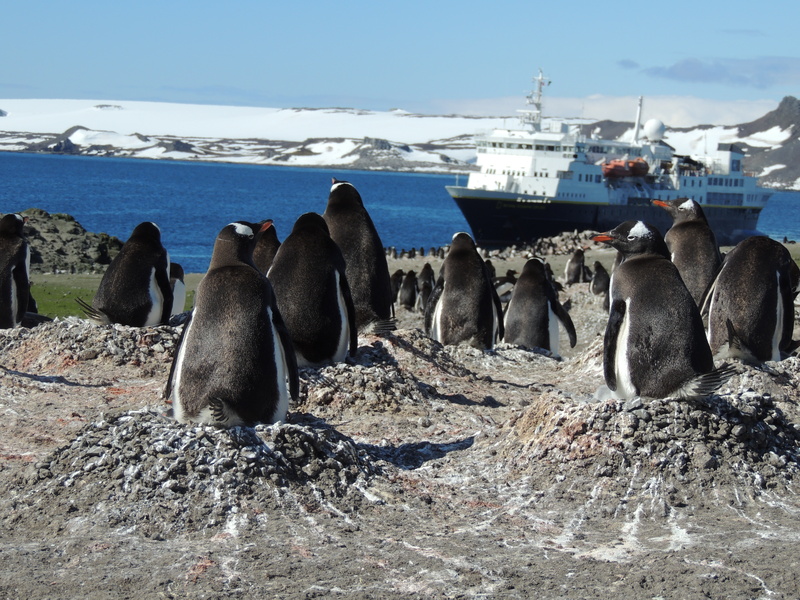 We then headed into the Lounge for another enlightening recap session with a presentation from Zach about the expedition through the dark Antarctic winter in search of an Emperor penguin egg as well as a presentation about the habits and traits of the Emperor penguin from Deirdre. 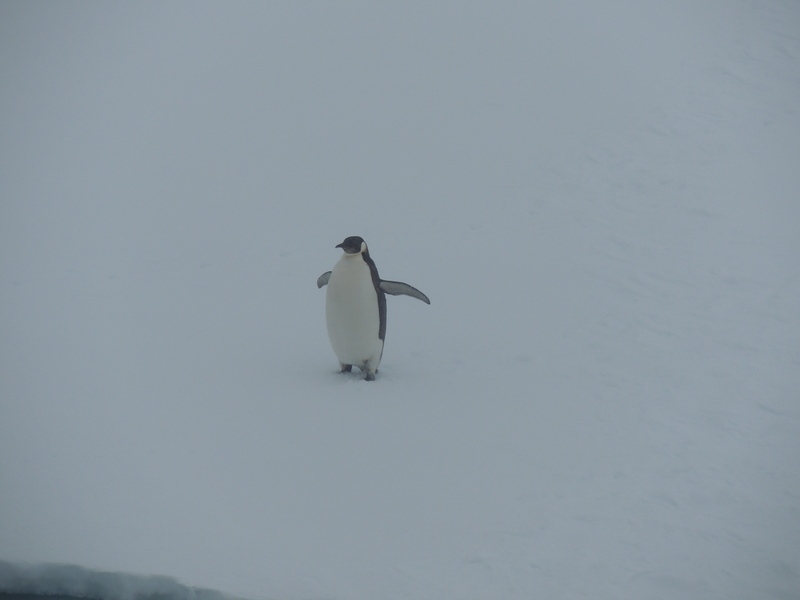 Of course, these presentations were inspired by the rare Emperor penguin sighting yesterday. Paul also shared his dive footage from the shipwreck at Enterprise Island yesterday as we were kayaking (check out his Meet the Ocean podcast). 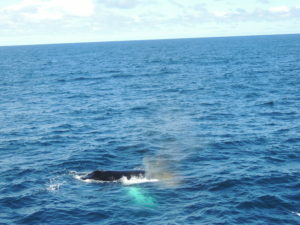 The underwater world is a rainbow of interesting creatures. 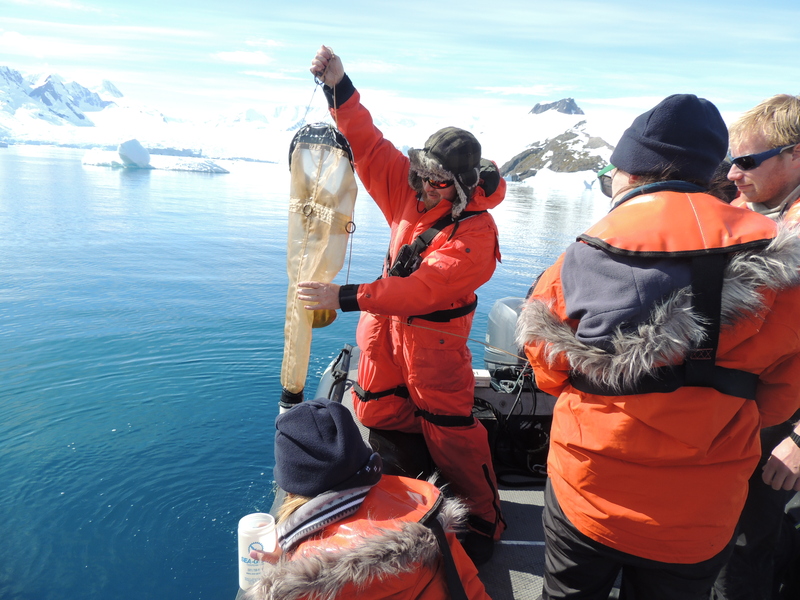 There were sponges, sea stars, anemones, and sea worms in addition to the shell and propeller of the 100 year old shipwreck. 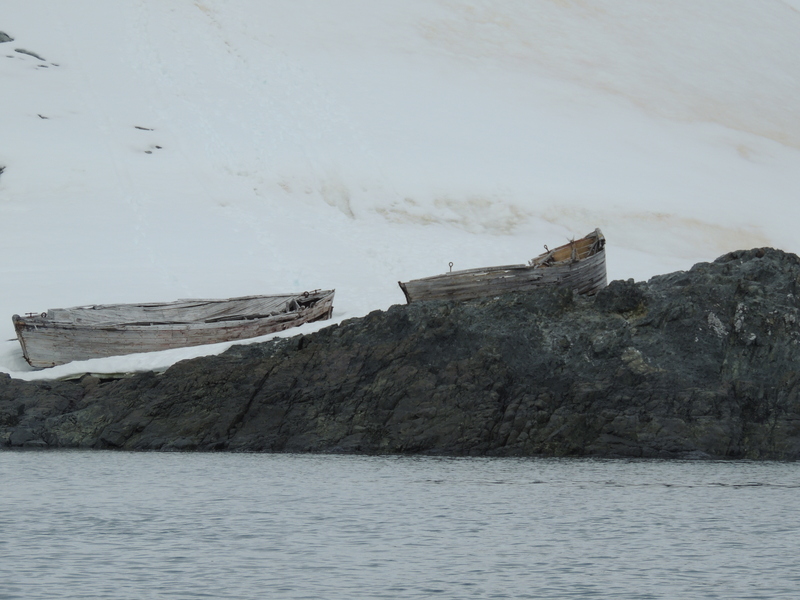 He also pointed out some whale bones as this was one of the last whaling vessels in the area. 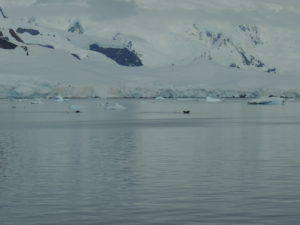 The evening concluded with a lovely dinner conversation with a few of the guests and Steve, our photography instructor. 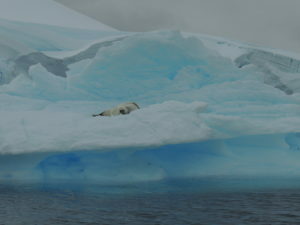 We are now heading to Neko Harbor for another early start tomorrow morning. 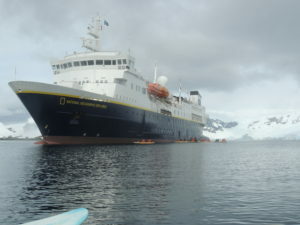 Today began with a 5:45 am wake-up call at our hotel in Buenos Aires. 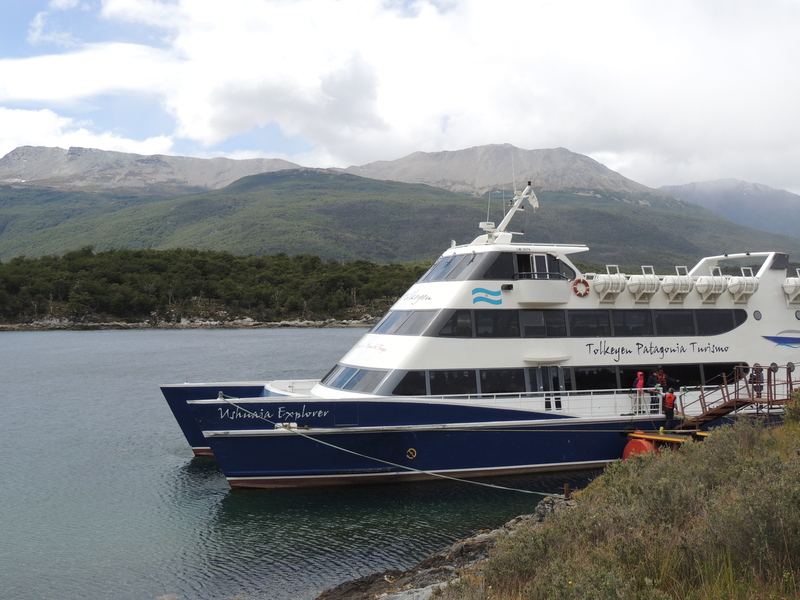 We enjoyed breakfast at the hotel before taking a short bus ride to the Jorge Newbery airport. 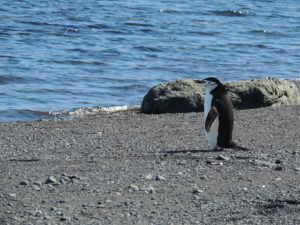 The airport sits along the Rio de la Plata – which serves as a border between Argentina (Buenos Aires) and Uruguay – it’s actually two rivers which converge (at the mouth the river is nearly 140 miles wide). 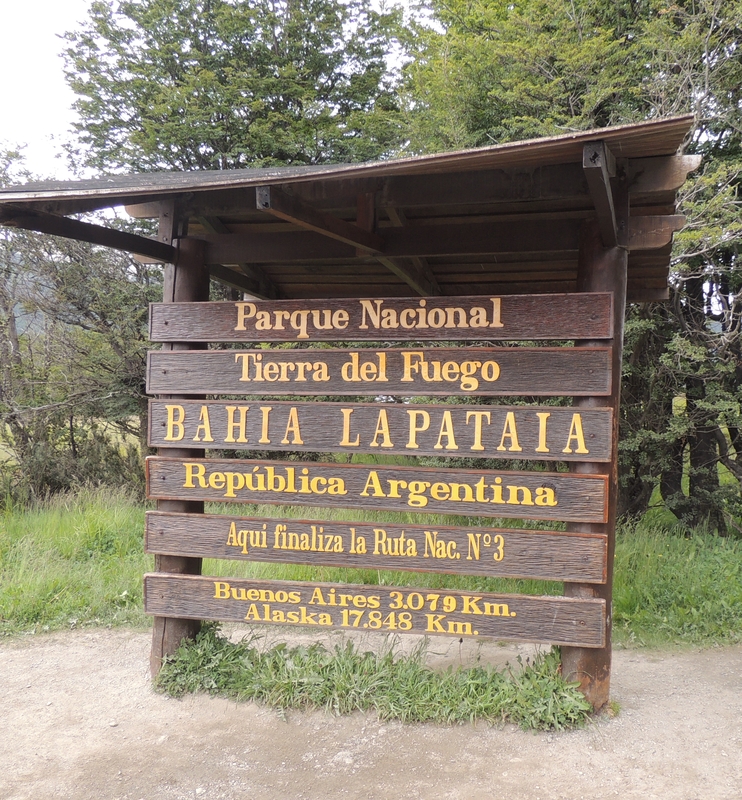 We also saw another side of Buenos Aires as we drove along the highway to Jorge Newbery airport as we passed large shanty towns. 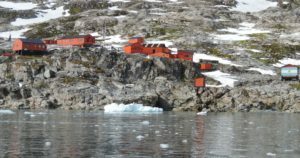 They are tall structures with makeshift walls and rain buckets along the rooftops. 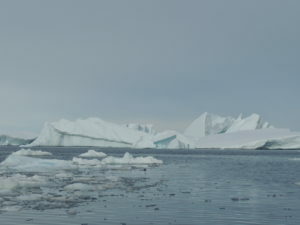 The towns appear to have power as many of the homes did have air conditioner units on the side – though it was an extremely poor part of town. 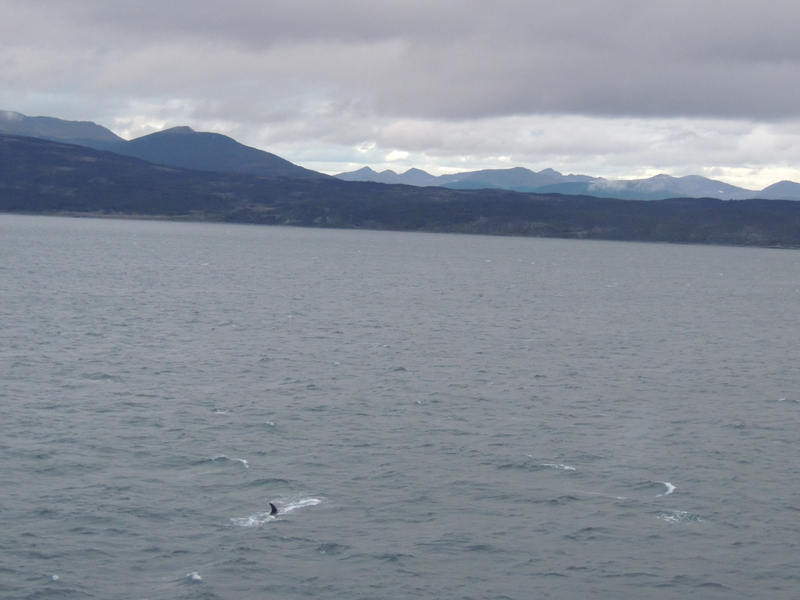 Our charter flight to Ushuaia was about 3 hours in duration, but there were clouds below so there wasn’t much opportunity to view Patagonia from the airplane windows. 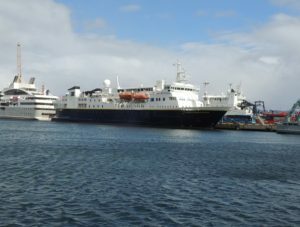 We took a bus from the Ushuaia airport to the Tierra del Fuego National Park where we boarded our catamaran for a cruise along the Beagle Channel. 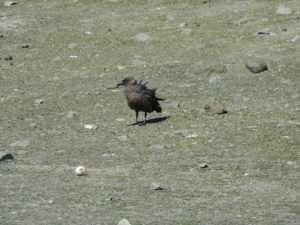 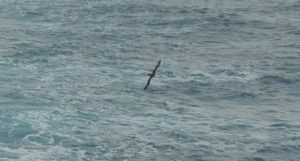 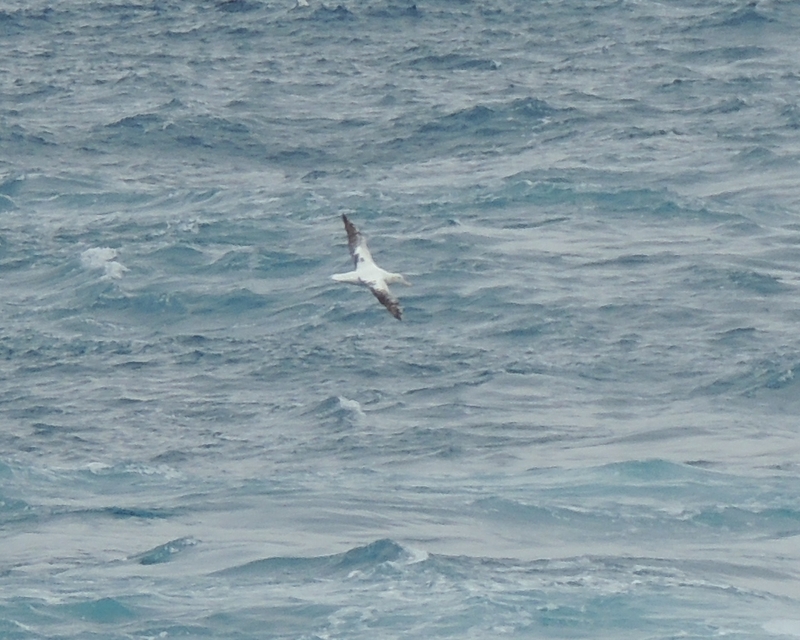 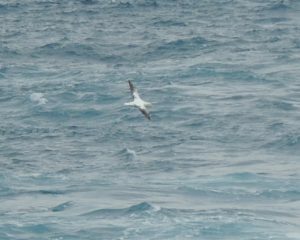 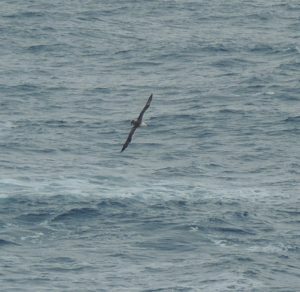 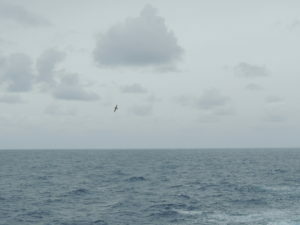 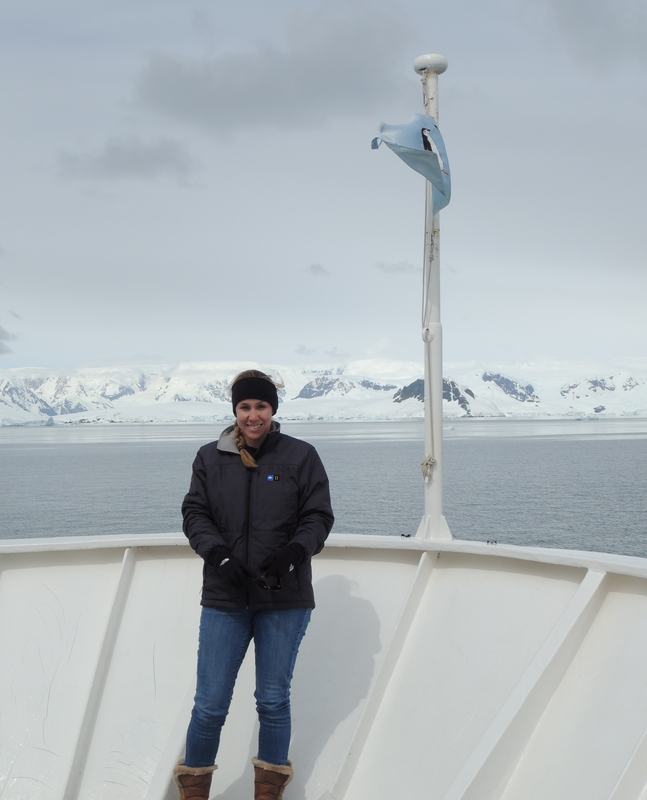 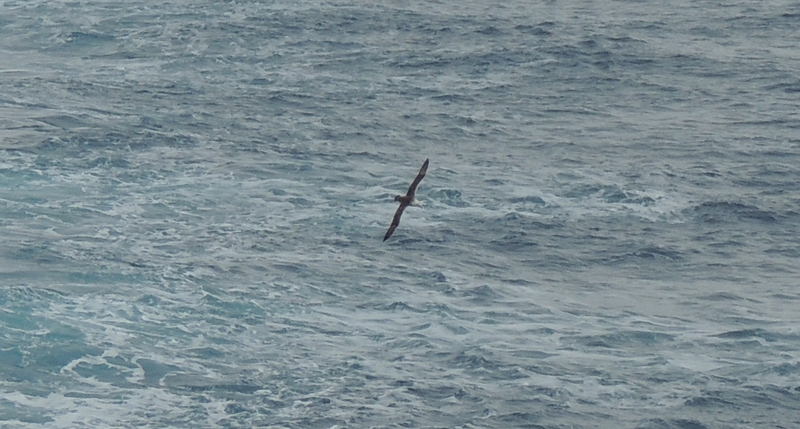 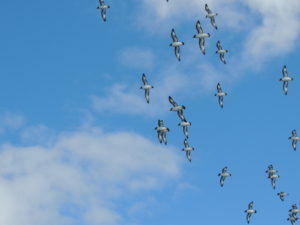 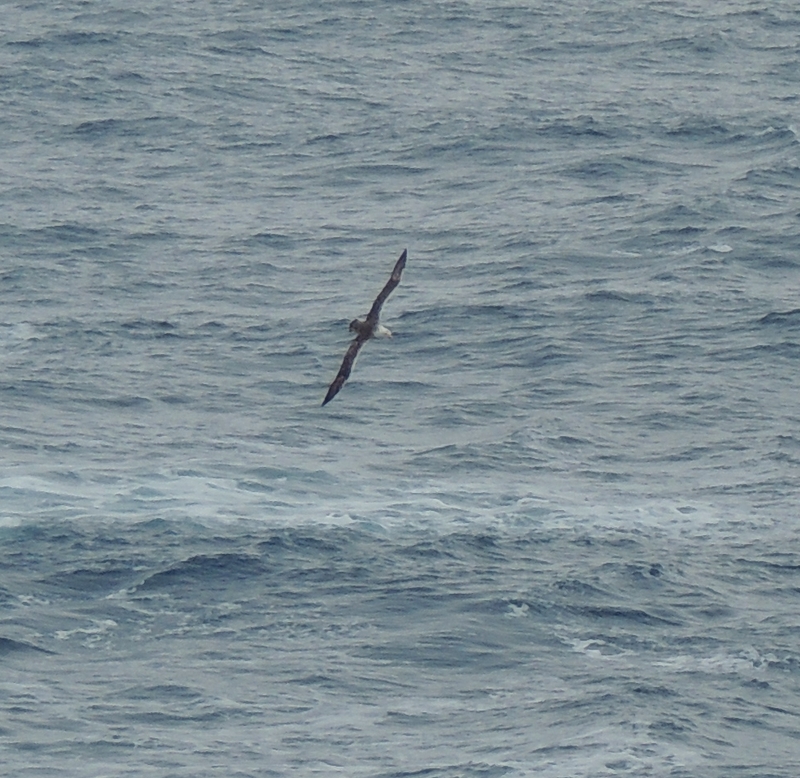 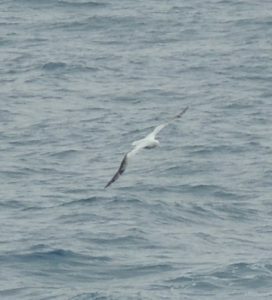 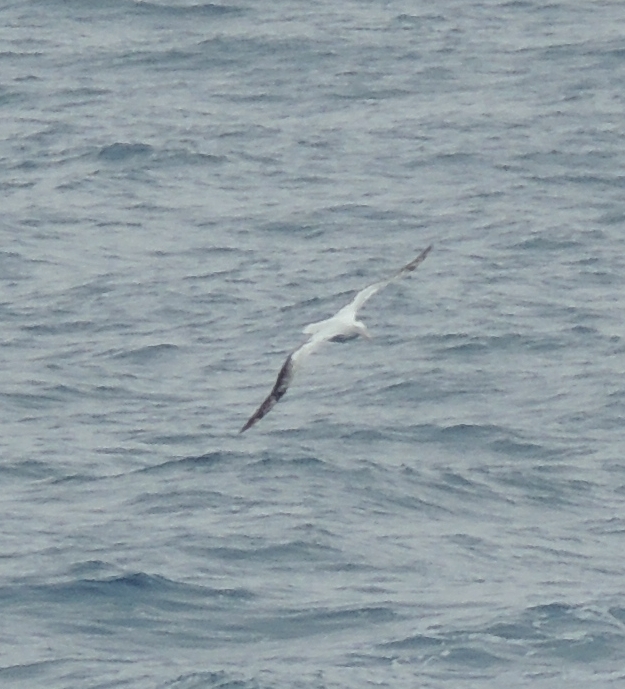 On the cruise we caught our first glimpse of the seabirds that would follow us across the Drake Passage. Tierra del Fuego may be the most beautiful place on Earth. 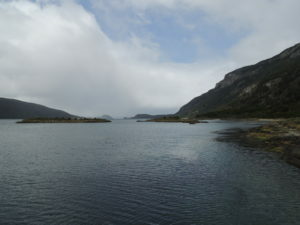 With the crisp air, hazy fog drifting in and around the mountains against the lush green forest background, the view is majestic and awe inspiring. 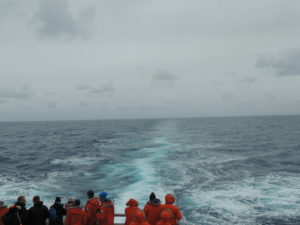 This is a place I want to visit again. 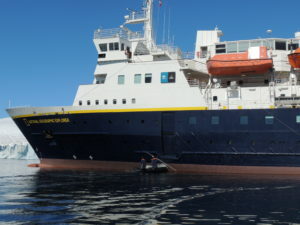 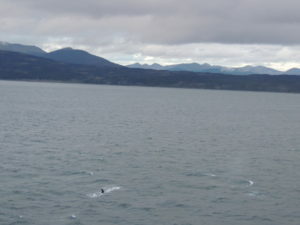 As the catamaran pulled into the port of Ushuaia, we saw our ship, the National Geographic Explorer, waiting for us. 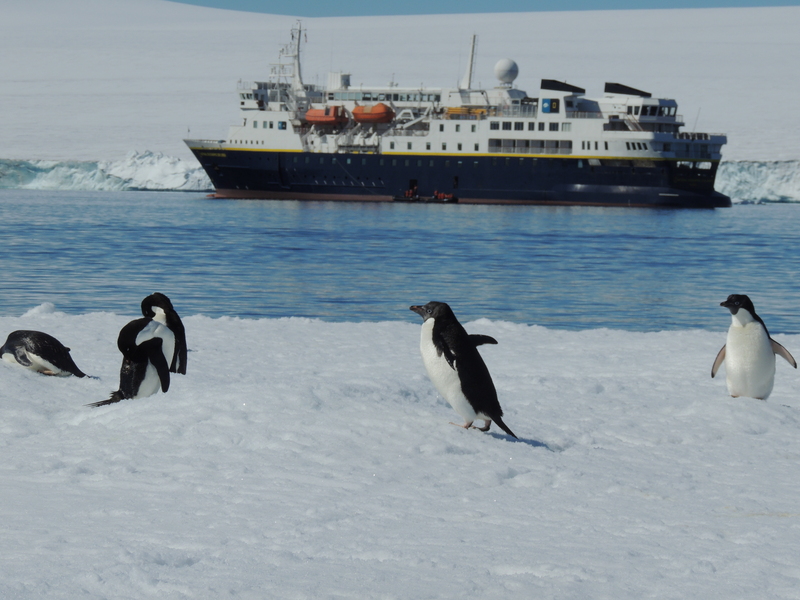 We were welcomed aboard our home for the next 10 days and settled in to room B-209. 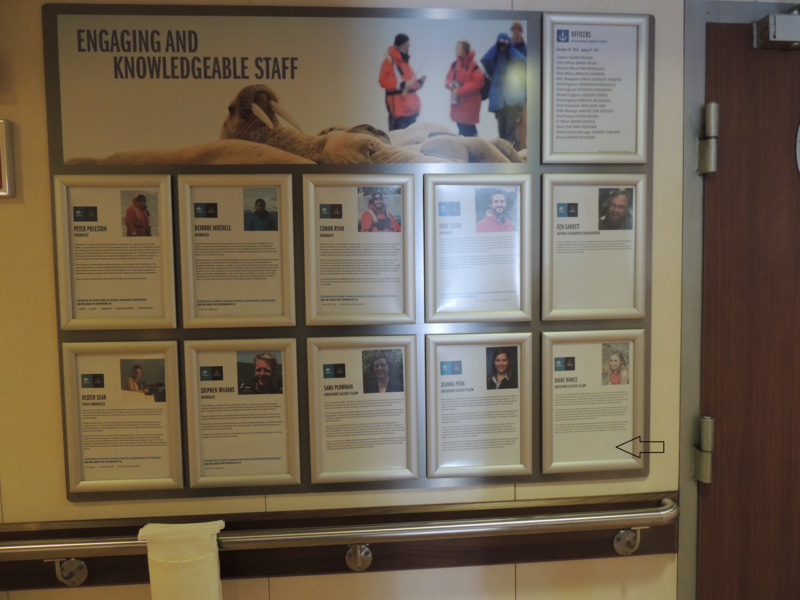 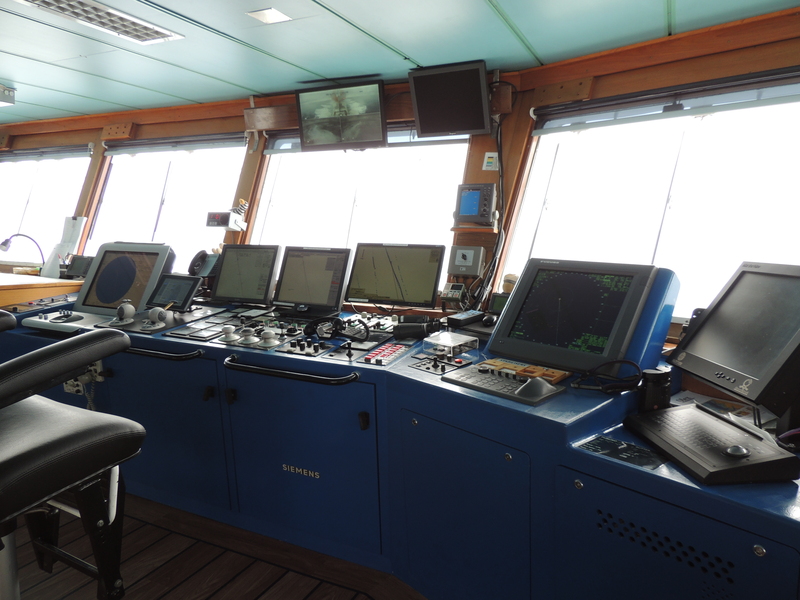 We are staying on the staff level of the ship, next door to the naturalists, divers, and expedition leaders. 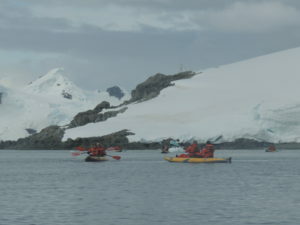 We are also near the mud room which is where the kayaks and zodiacs will depart when we land in Antarctica. 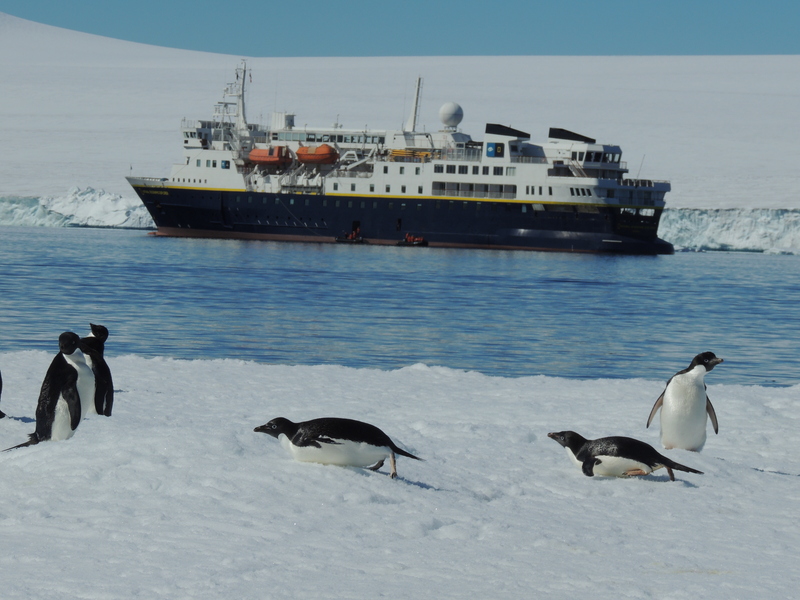 It’s a convenient place – though the ship is sized just right, all of the common areas are easily accessible. 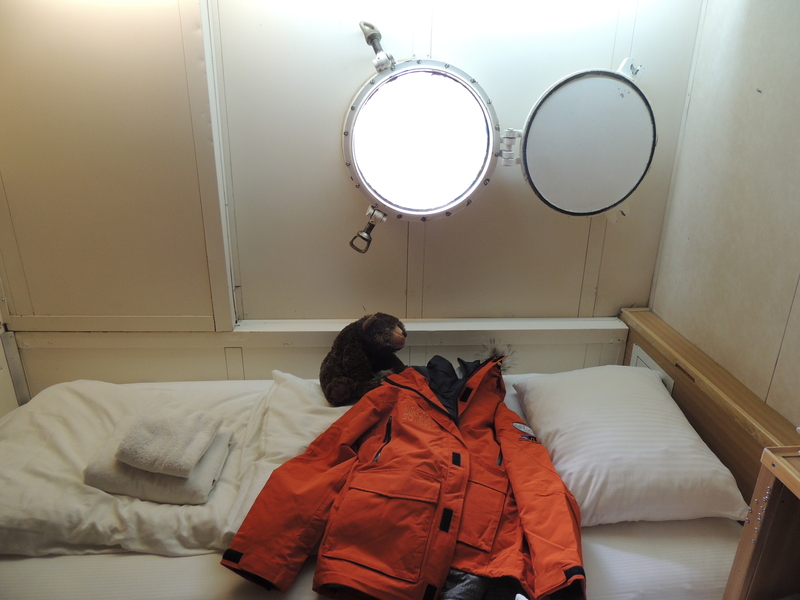 My Antarctic expedition parka was waiting for me on my bed. 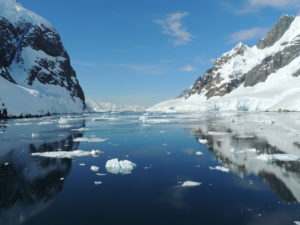 It’s gorgeous and SO warm. I am going to treasure it dearly for the rest of my life. 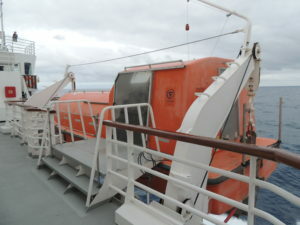 First order of business aboard any ship is safety so we all met in the lounge for a safety drill donning our life jackets. 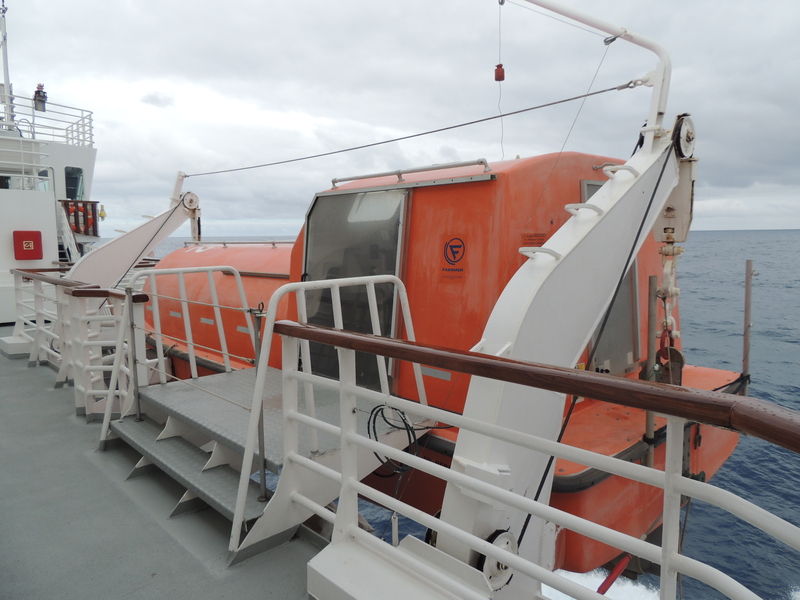 While we don’t expect to use the life boats on this trip, it is reassuring to know that they are ready for us should the need arise. 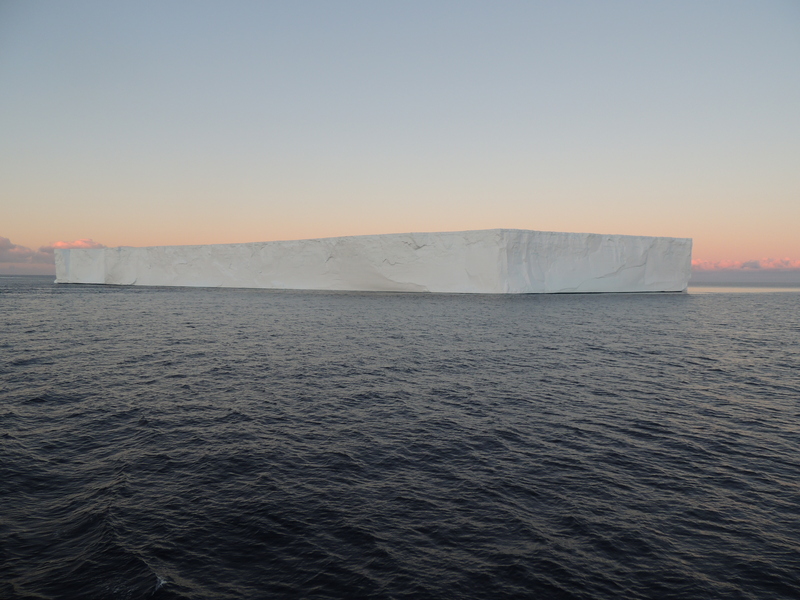 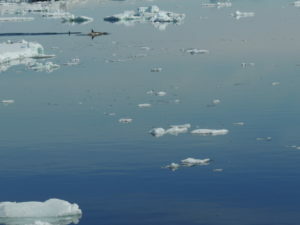 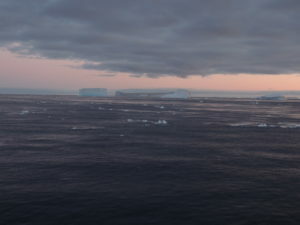 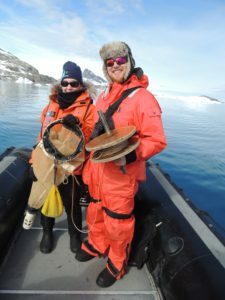 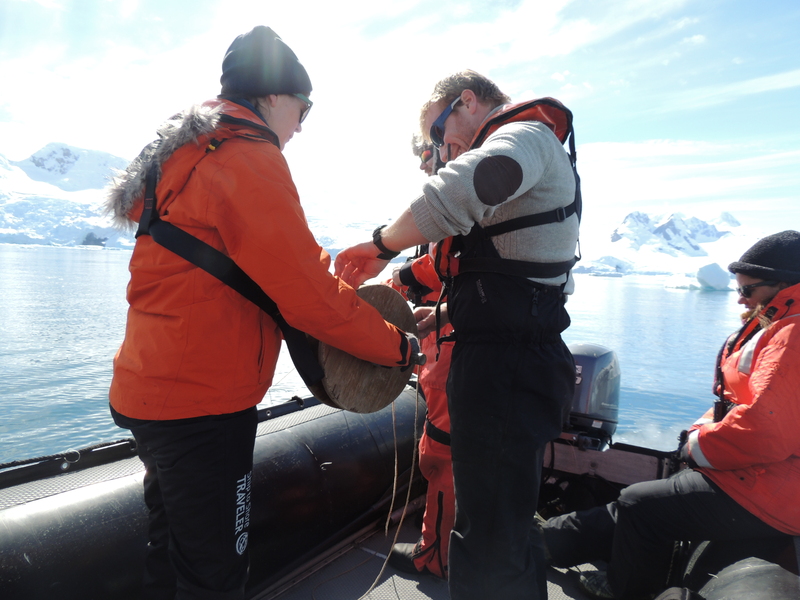 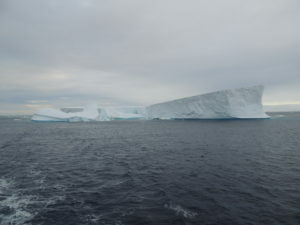 They are also enclosed and contain enough food/water for 3 days (for 60 people) – again, I pray they are not necessary, but they will offer some protection against the icy Antarctic wind and it is comforting to see them standing by as we travel about the ship. Jeanna, Sara and I took some time to learn about the ship and how to navigate to the Chart Room (where there drinks/snacks are always available and the view is superb – just below the Bridge), the Bridge (the Explorer has an open bridge policy so we are welcome to visit any time – it is so interesting to observe the tools and machinery in action as the captain and crew safely navigate our ship and the Wellness Deck. 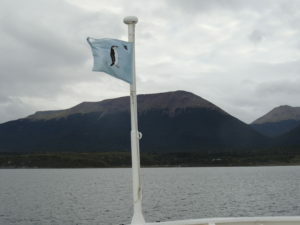 We also figured out how to get out on the Bow which is said to be a prime wildlife viewing area if you’re willing to brave the winds. 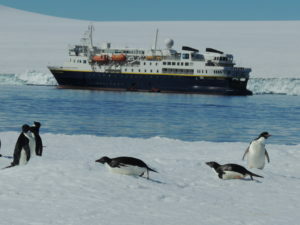 The evening dinner was buffet style in the ship restaurant. 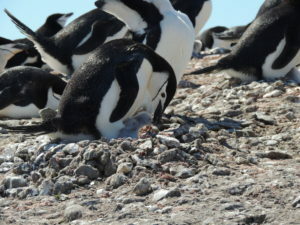 Delicious and plentiful. I can already tell I may need to do some shopping when I return – I am going to eat a lot on this trip! After dinner I set out on a mission to find and enjoy the ship’s Library. I grabbed a cup of hot chocolate at the Bistro and settled in to a comfy Library chair to observe the view as we travelled along the Beagle Channel. 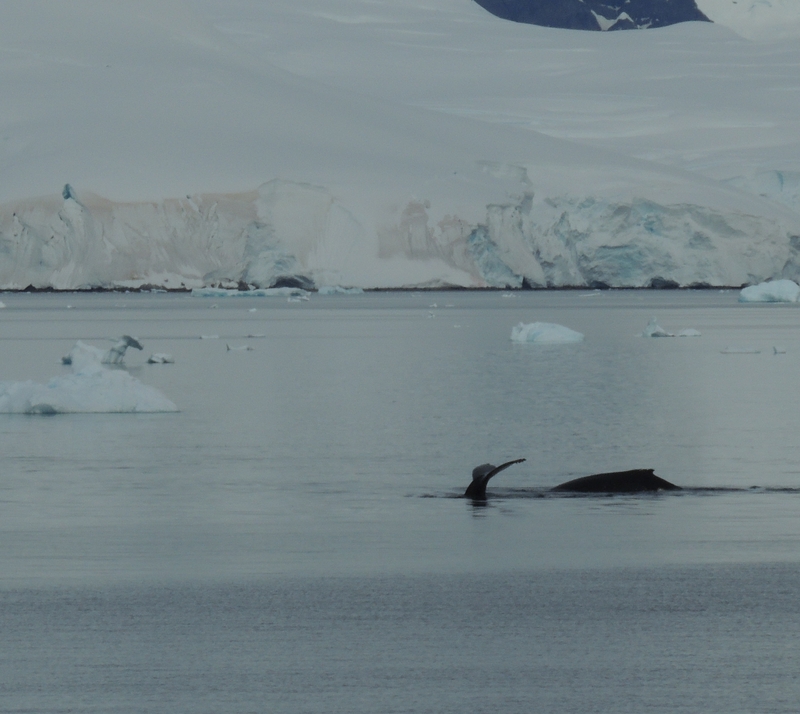 Just as I was getting settled, Sue Perrin, our expedition leader, made an announcement that there was a Sei whale off the Port Bow. 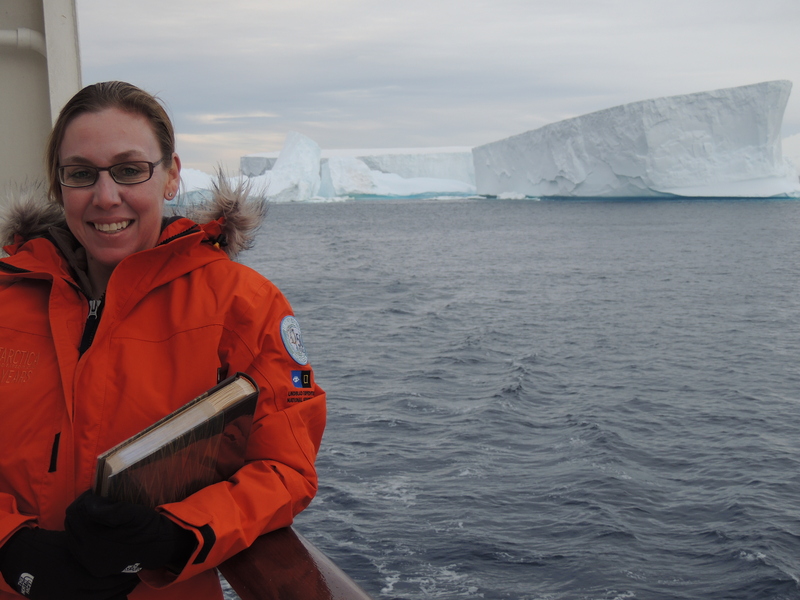 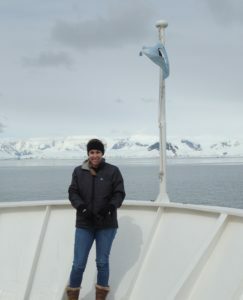 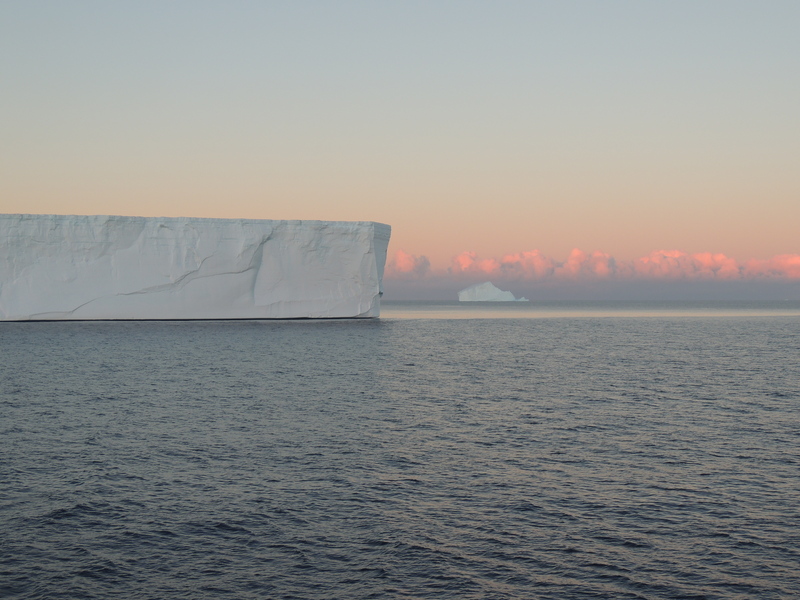 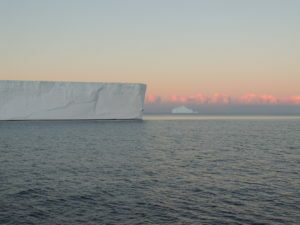 Since I was already at the front of the ship, I quickly jumped up and headed outside into the brisk evening air. 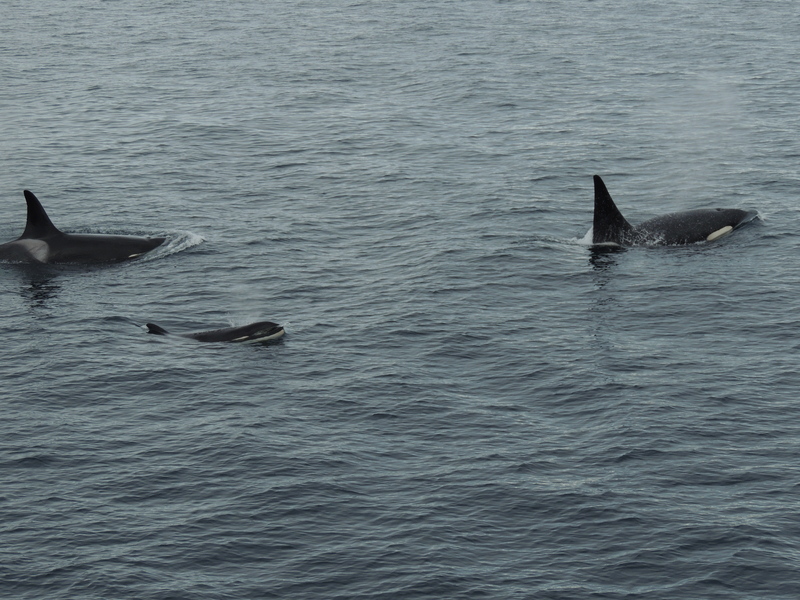 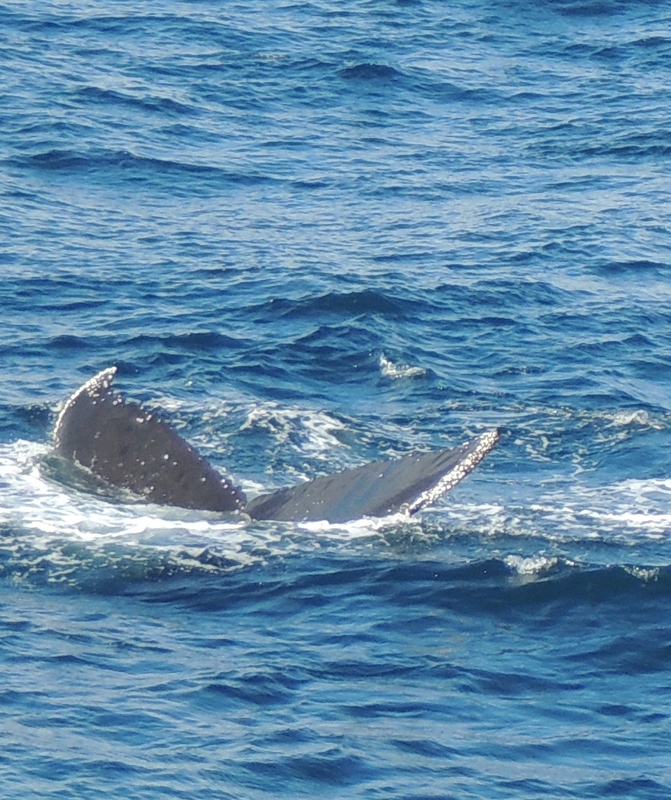 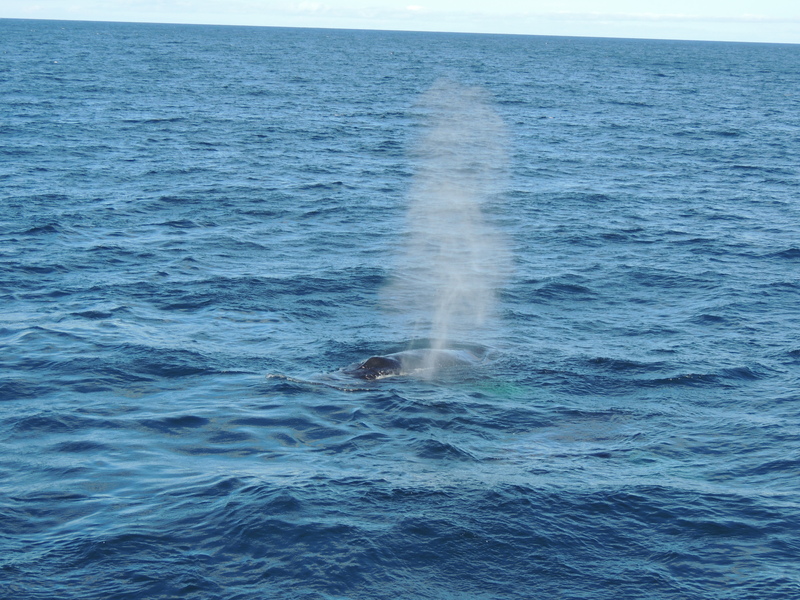 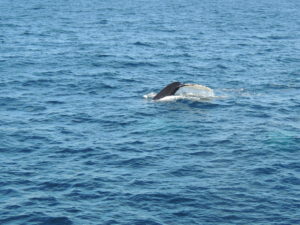 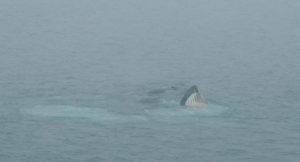 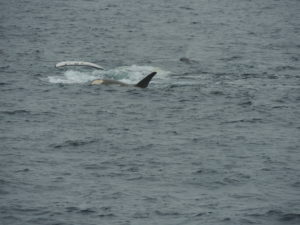 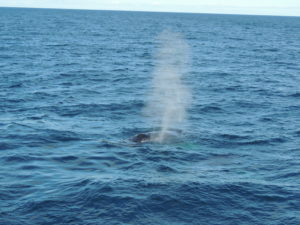 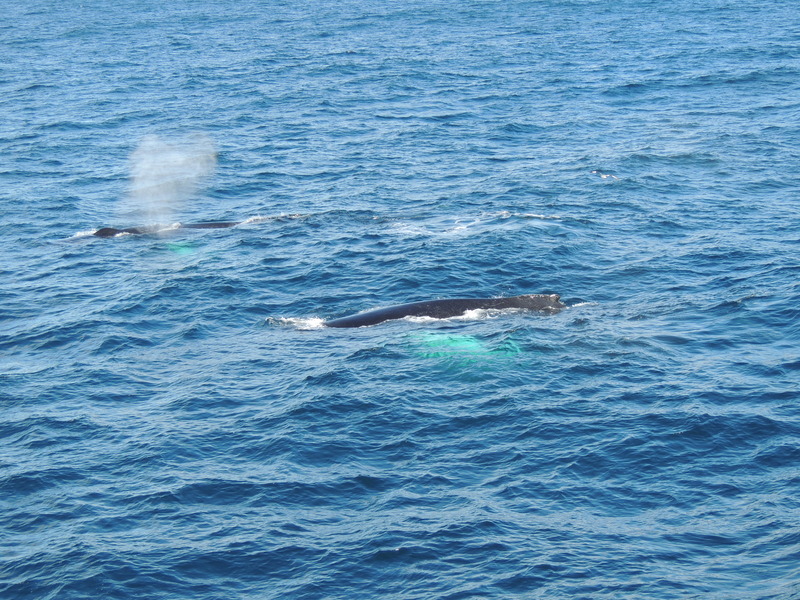 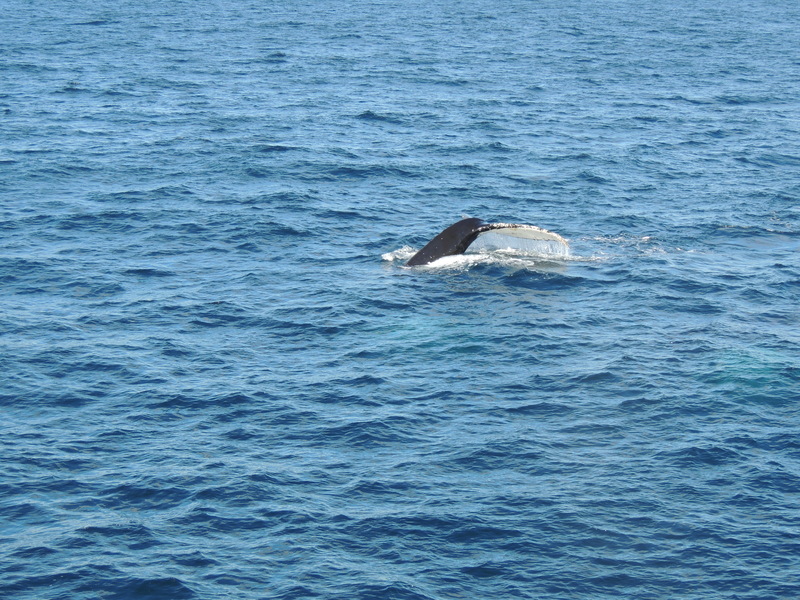 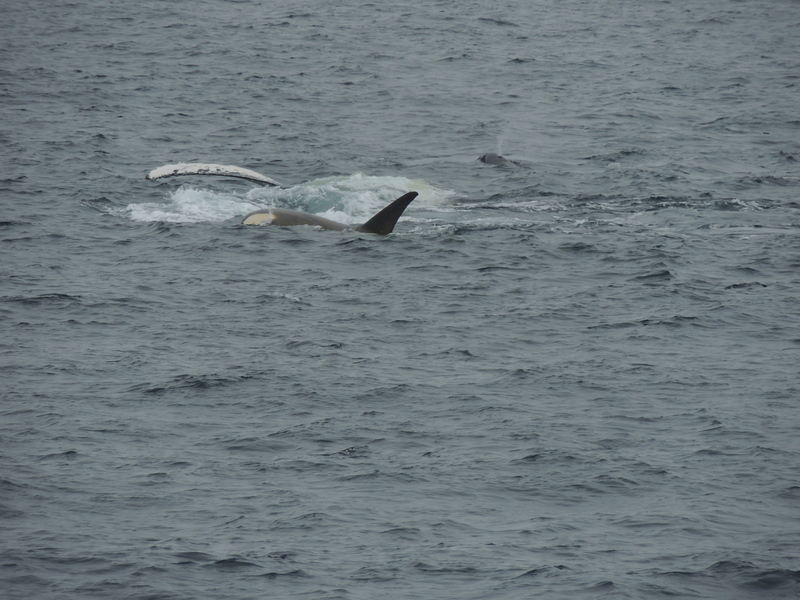 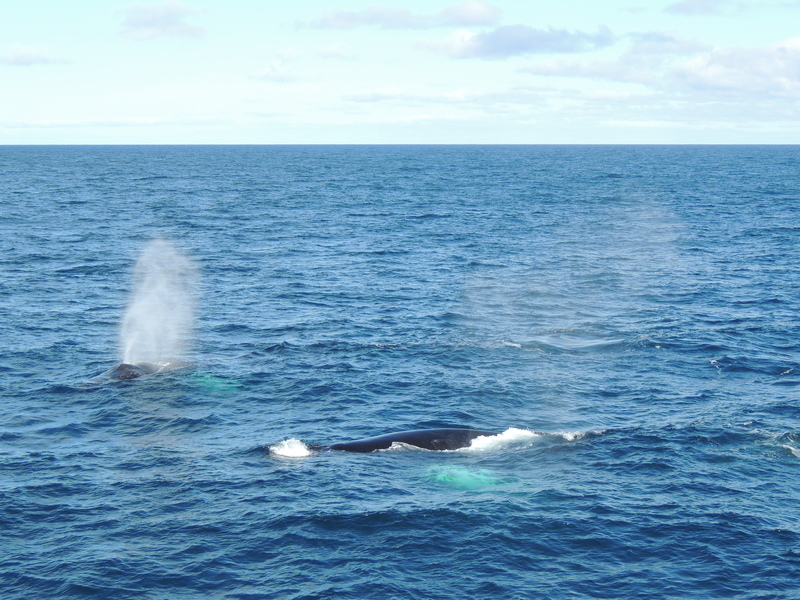 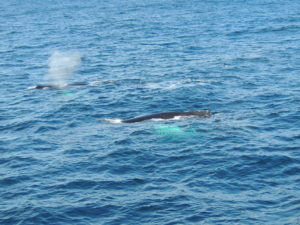 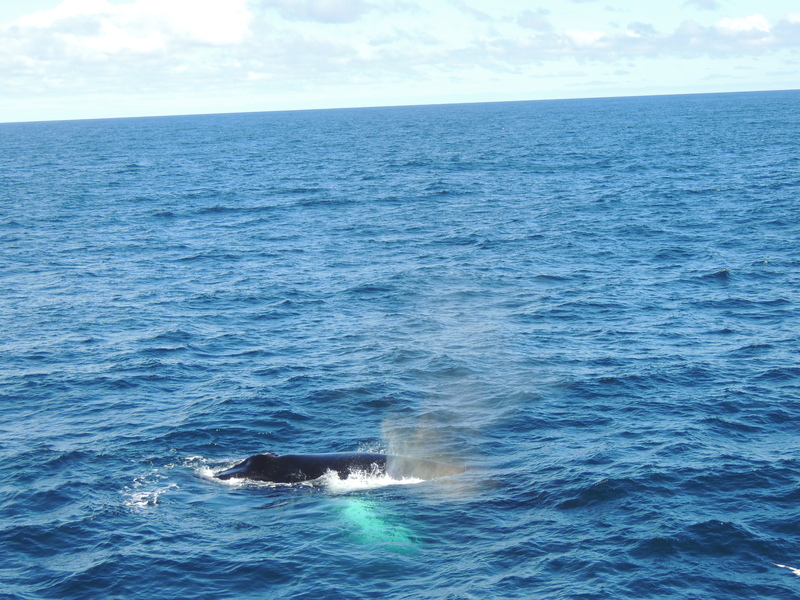 As I arrived at the ships rail, just outside the Bridge, I saw the whale – my first whale. 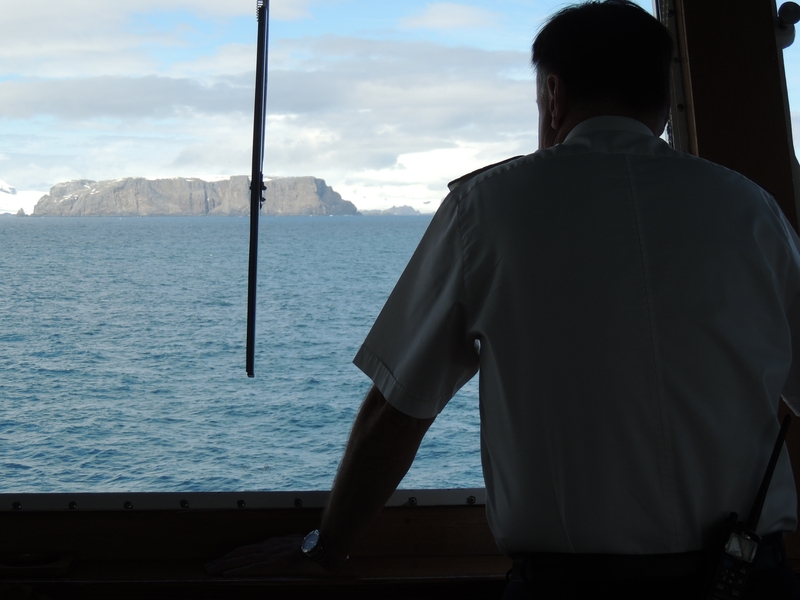 It’s the first day onboard and I have seen more than most see in a lifetime. 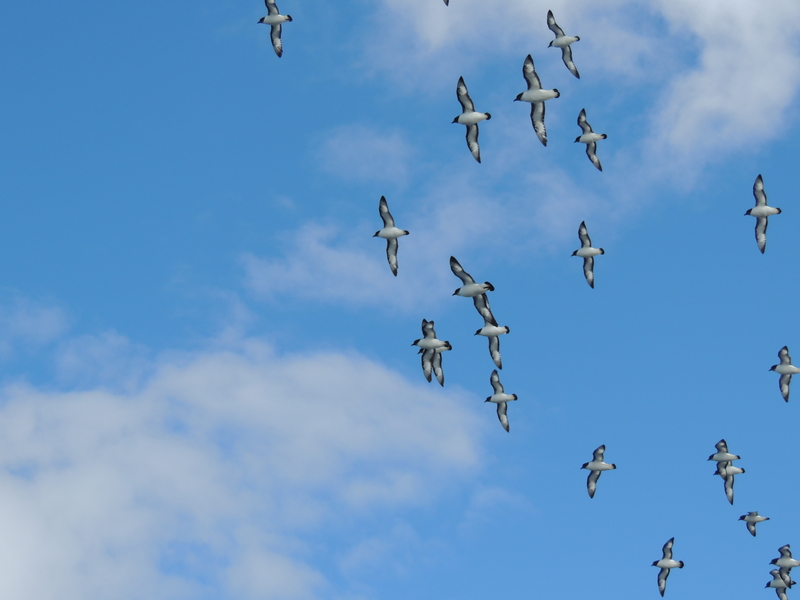 I am so excited about what the coming days will bring. 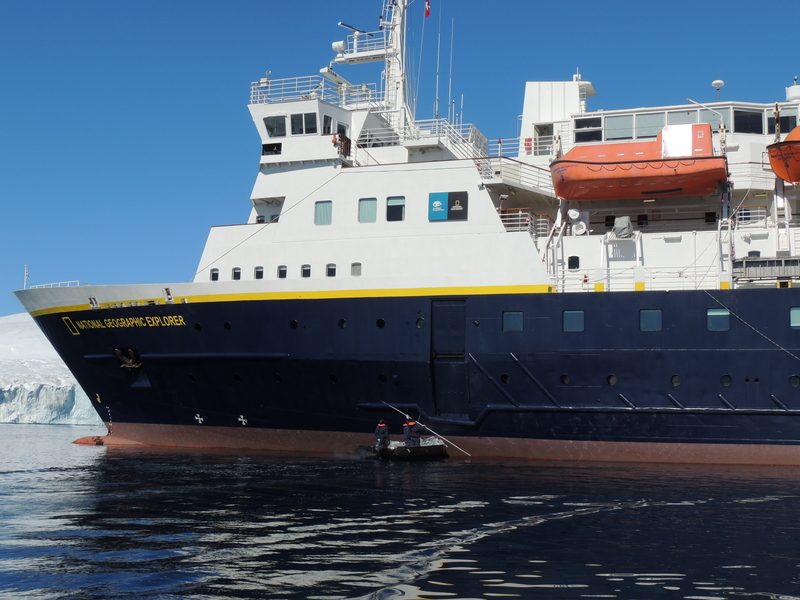 Tomorrow morning our mentor Eduardo has promised a personal tour of the Explorer – looking forward to learning about what he and the other naturalists have to share to enhance this experience. It’s time for bed, and the Explorer is rocking me to sleep as we begin our journey across the Drake Passage. Though the seas aren’t expected to be rough per se, Sue warned us that we will certainly feel them. 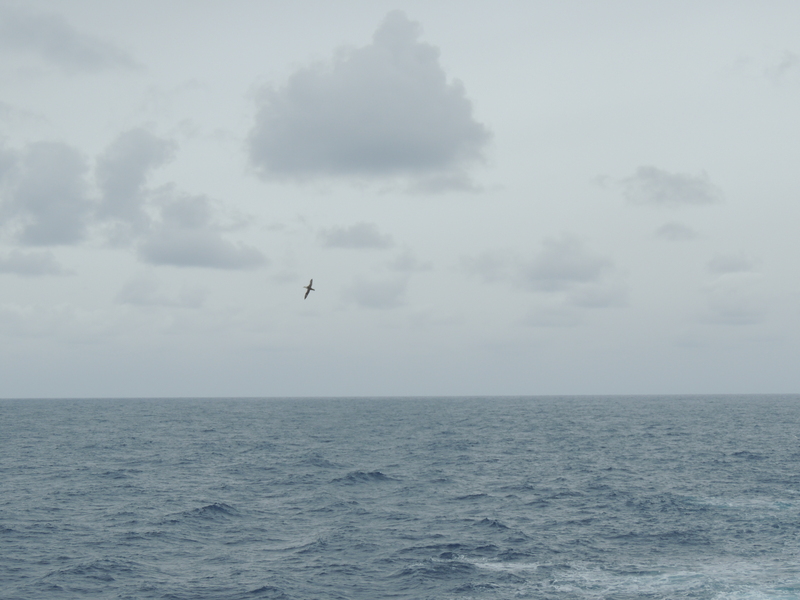 I am armed with my seasick medication to make sure the passage goes smoothly and cannot wait for another exciting day tomorrow. Tonight is our last night of real dark so I need to take advantage of it – tomorrow we will be in 18 + hours of sunlight with no “true” dark night. 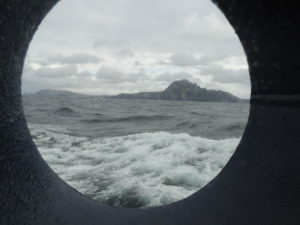 This morning I awoke to beautiful Cape Horn out my port hole window. Today I traveled through the Southern Ocean, the Pacific Ocean and am now in the Atlantic Ocean heading to the Beagle Channel en route to Ushuaia. 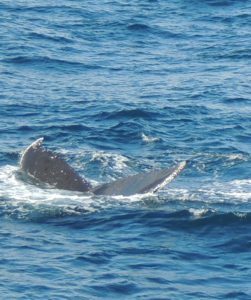 Today (1-5-2017) I saw more whales than I can count as we sailed the Gerlache Strait heading toward Dallman Bay. 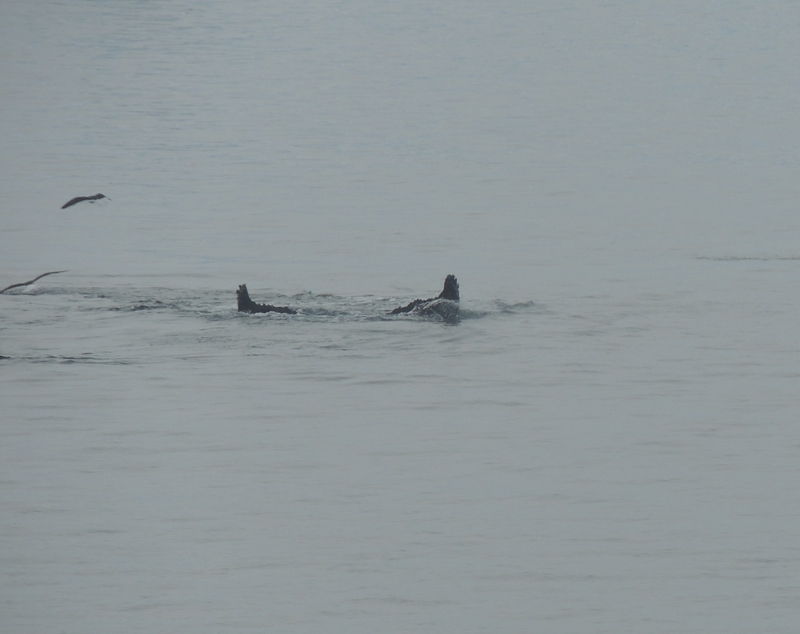 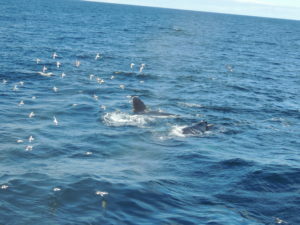 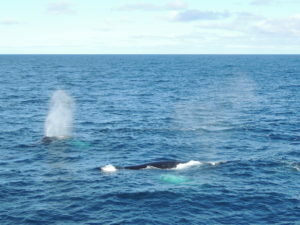 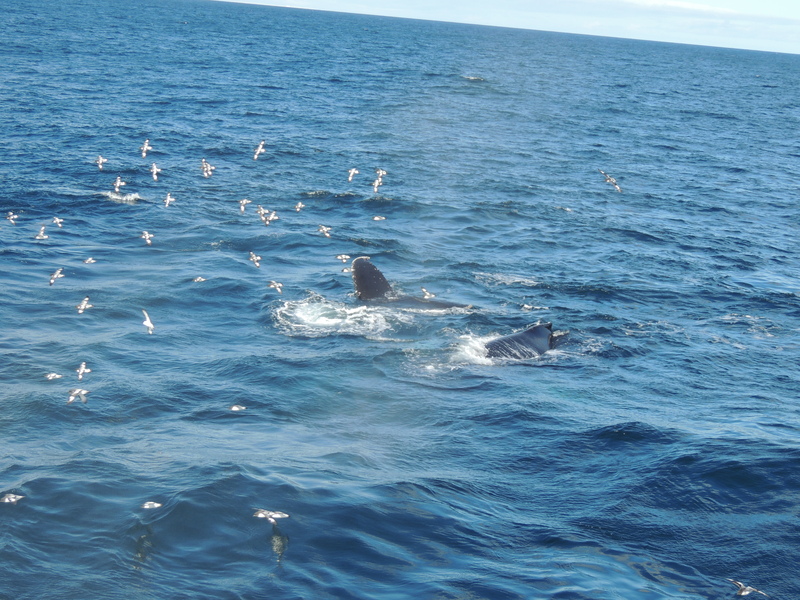 What types of whales do you think I saw? 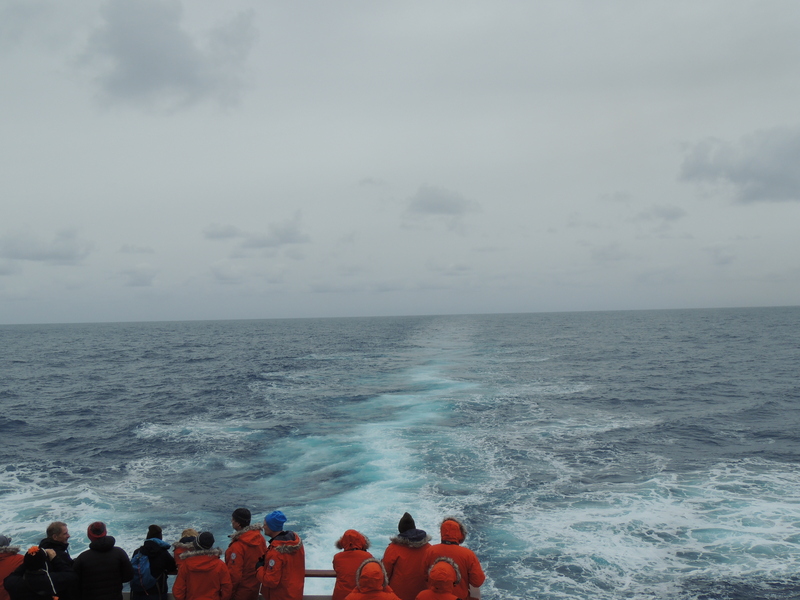 More pictures coming soon – we are at sea so the internet is rather slow.